What a bride wants on her wedding day; to look beauteous and gorgeous. Mehandi is an integral part of our Indian culture. Whichever occasions come, drawing mehandi on hands and feet is considered auspicious and good omen. Especially for a girl who is going to be a bride. 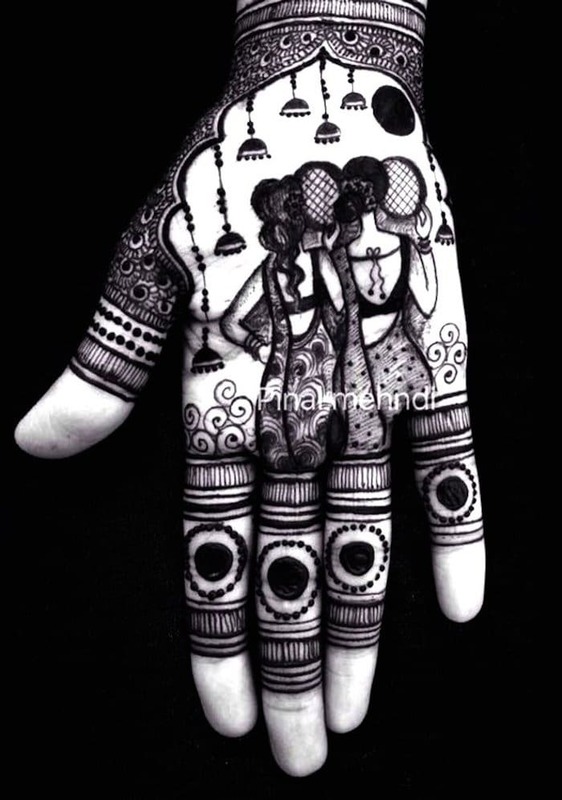 Perhaps in every culture of India mehandi holds a special place. And apart from any occasion, you can see girls’ hand covered by mehandi as a way of fashion nowadays. 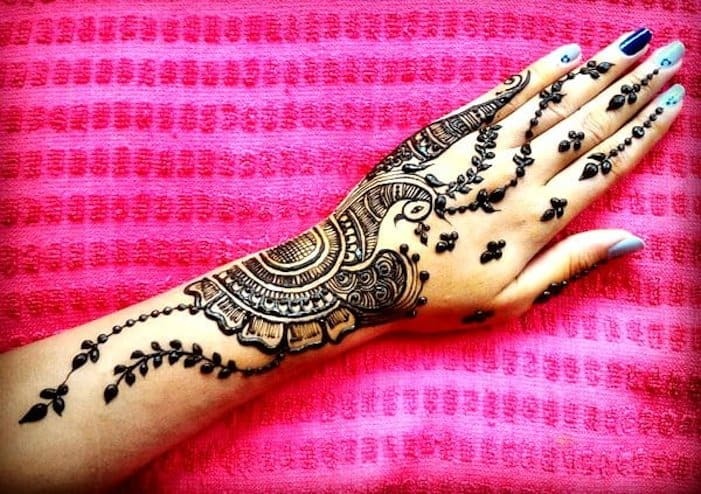 There are many and different easy mehandi designs that you can try on your wedding. 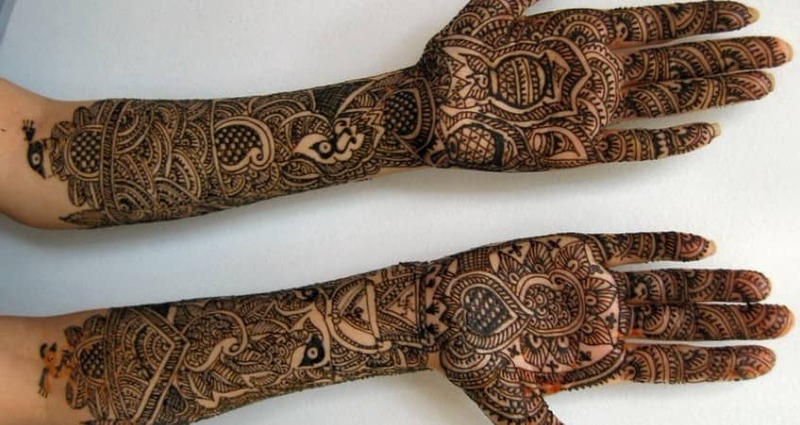 What type of mehandi and its design you want depends on you. Though it could be that you get confused seeing so many designs. Choose what you like and even you can ask your would-be beau for it. Some girls also have their beaus’ initials drawn on their hands. A way to show love. 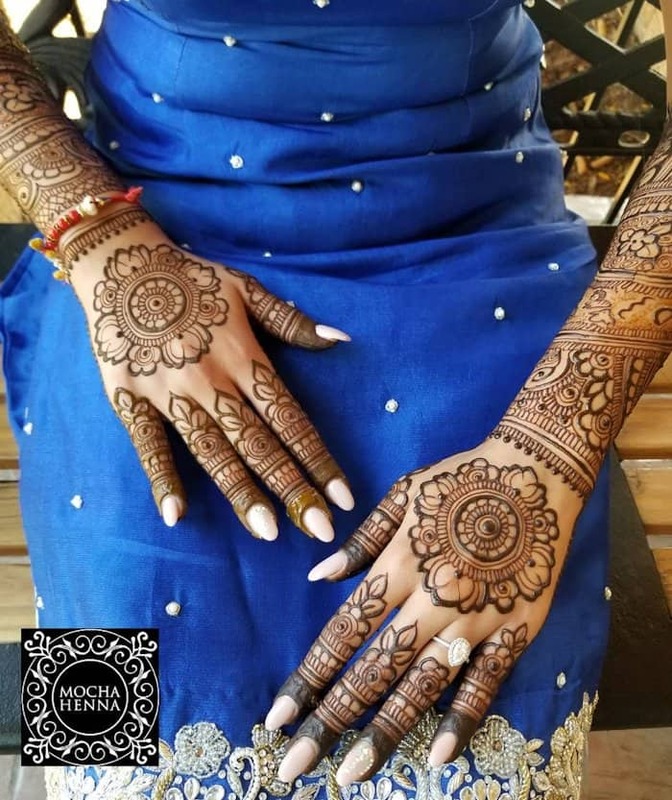 Select the best mehandi designs 2019 for your wedding and ceremonies and be the queen in your wedding, though you already are! And Mehandi is not only for brides-to-be. Anyone can have it, even boys too. 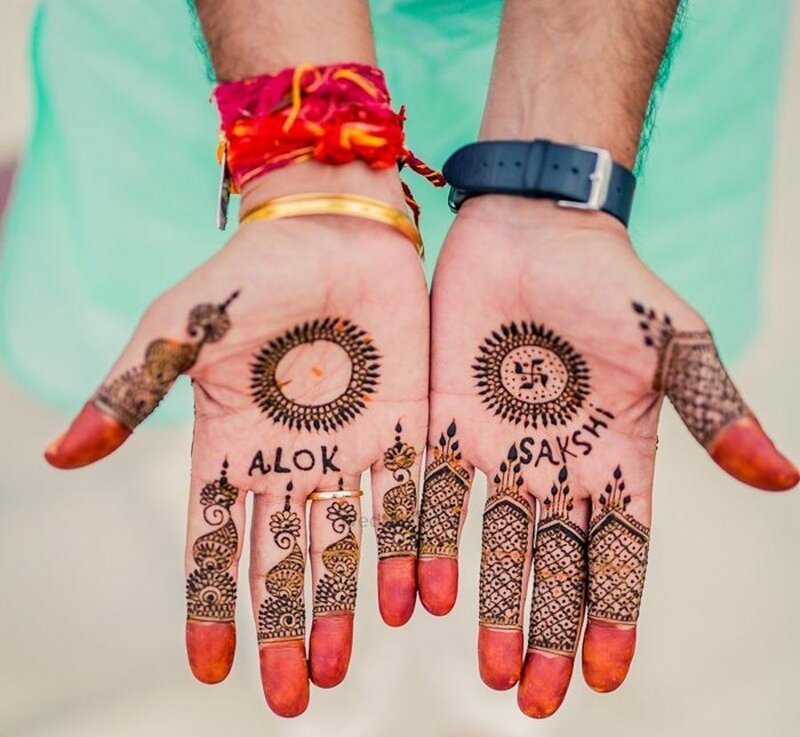 In times of Kings and Maharajas men did, some today too, in some Indian traditions men can also wear mehandi. 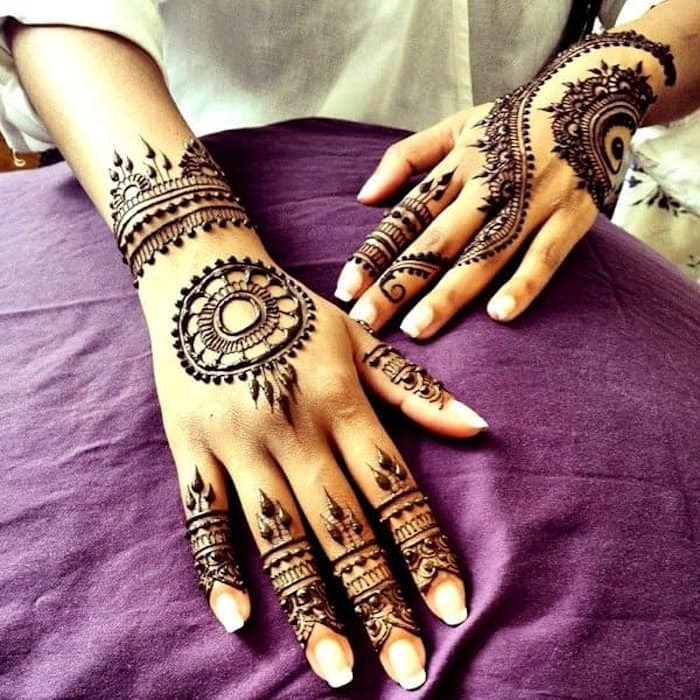 So this henna has traveled from old times of customs and rituals to latest fashion of nowadays. 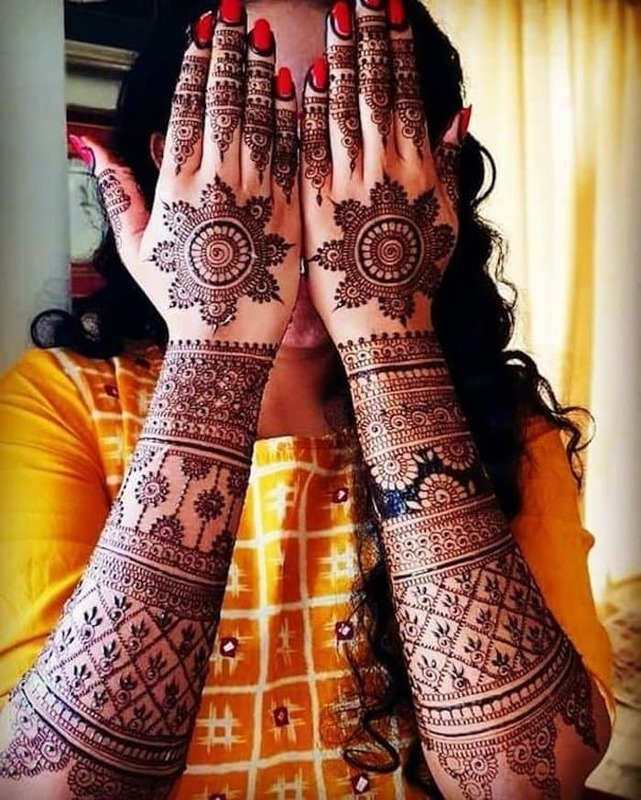 When you come to choose your favorite mehandi design 2019 from tons of it you perhaps get confused but you don’t need to. It is so easy to choose your favorite one. Choose what appeals to personal aesthetic and taste whether it is an intricate one, simple or from wrist to your forearm or any other. A design that defines you, have it on hands. 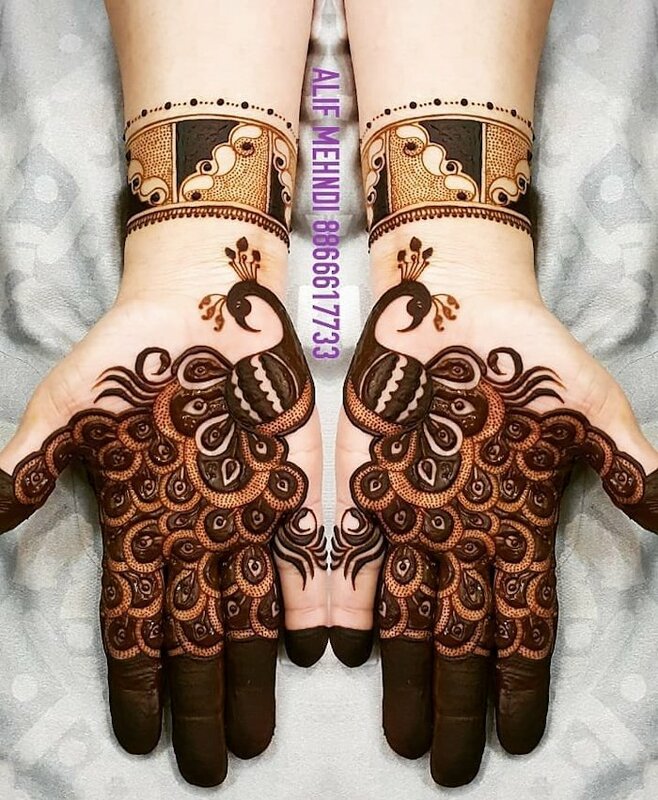 If you want to look for more mehandi designs, you can also see on Instagram and Pinterest. So you see so simple it is. 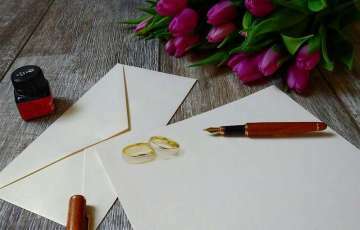 When completely drawn, show it to your love of life and he should see how beautiful his wife. Besides this, you can customize any design. 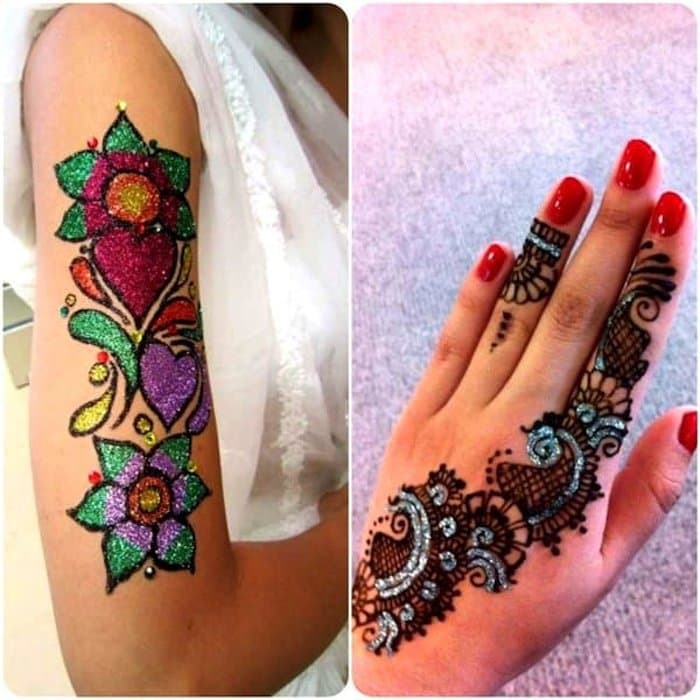 You can also hire mehndi artist for perfect draw. 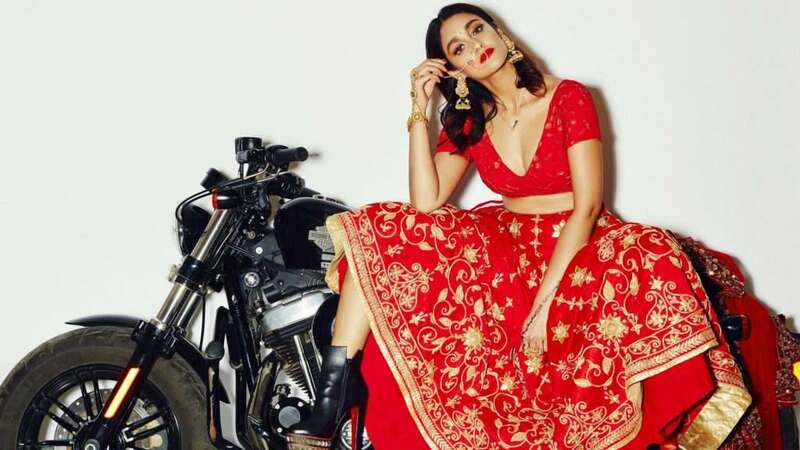 Here are some bridal mehandi designs 2019 that are popular. You see what you like for your wedding. Guests are also welcome to choose. Out of the gargantuan selection of riveting Mehandi designs, it’s the bridal mehndi designs which are adored most by the brides-to-be. There is no dearth of classic and timeless Mehandi designs. The complex patterns of intricate geometric structure, leaves, flowers accentuate the grandeur of bridal mehndi designs manifold times. Majority of the Mehandi designs in this category covers full hand. This Raja-Rani mehndi designs truthfully beautiful and drool-worthy like you are portraying yourself. 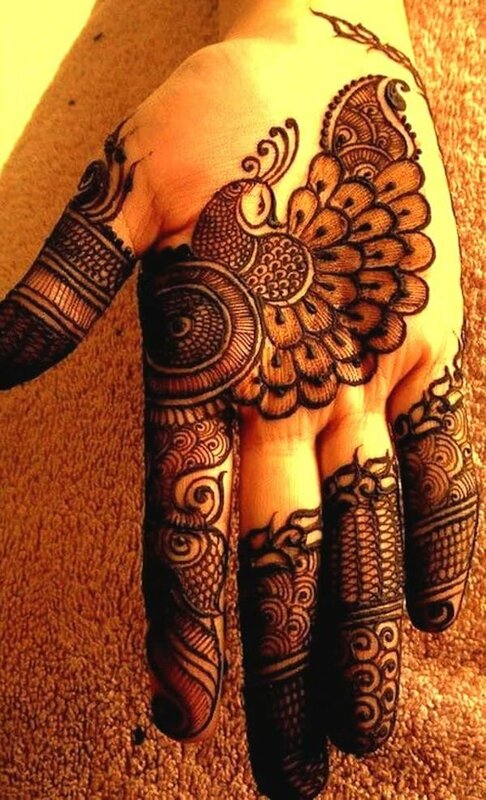 A modern design that didn’t get drawn earlier, and below the palm line this mehndi design goes intricate. Leaves and flowers, almost everything is there. 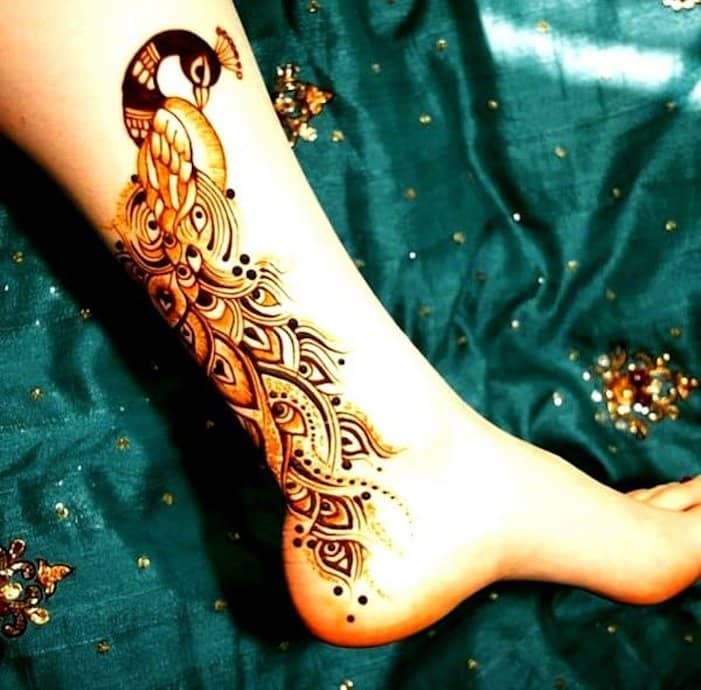 This leg mehndi design seems that your leg has worn a kind of jewelry. It is giving the feel of it. And the design matches like those designs that are drawn on villages’ huts and homes and big leaves seem like the eyes of a beautiful girl. Have you seen the peacock or a bird on the front hand, it resembles like that and some other design patterns on it seem like a peacock’s feathers. It is one of the best bird mehndi design patterns that you can apply. It is different with mixtures of others. Barley leaf mehndi design you can also see in it. 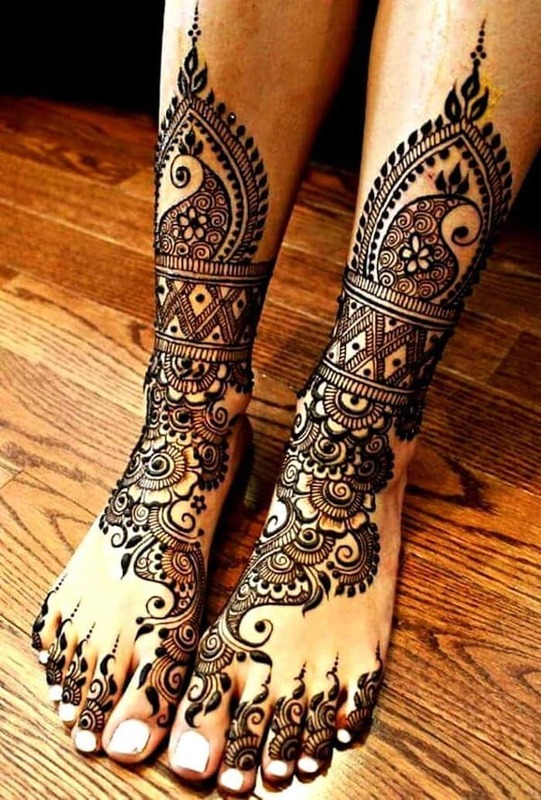 The leg mehndi design is inspired from mandala mehndi designs. Various shapes of it you can see there half and all circle design. Others are small flowers design. Small and intricate patterns of it. Half of the design is not visible, gets hidden by bride’s wedding dress. 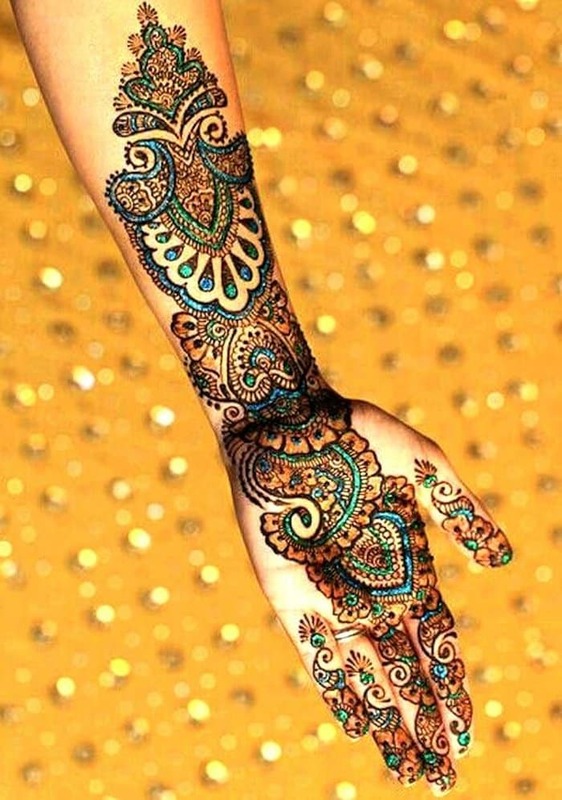 It is the full hand intricate mehndi design like painting the whole hands. Flowers design patterns around the wrist sides but different in both hands. 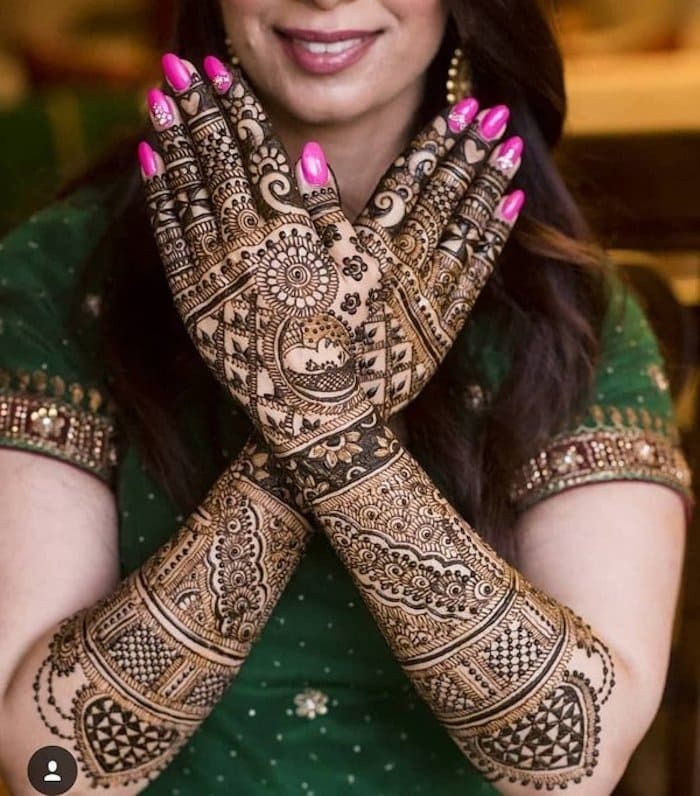 This hand mehndi design is not the same in both hands and flower jewelry making it more appealing and the bride’s pose too. 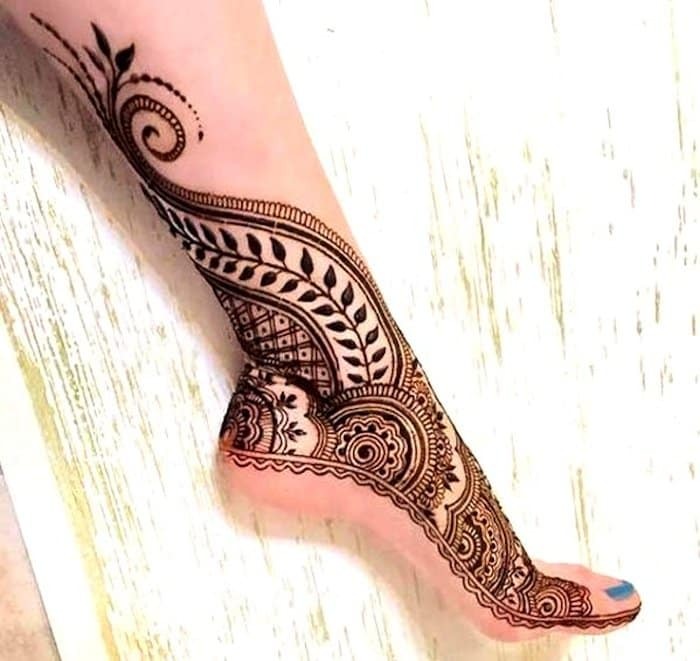 This leg mehndi design is like an open pattern, looks ethnic and comfortable. And there are small stars patterns drawn on them including chequered mehndi design. 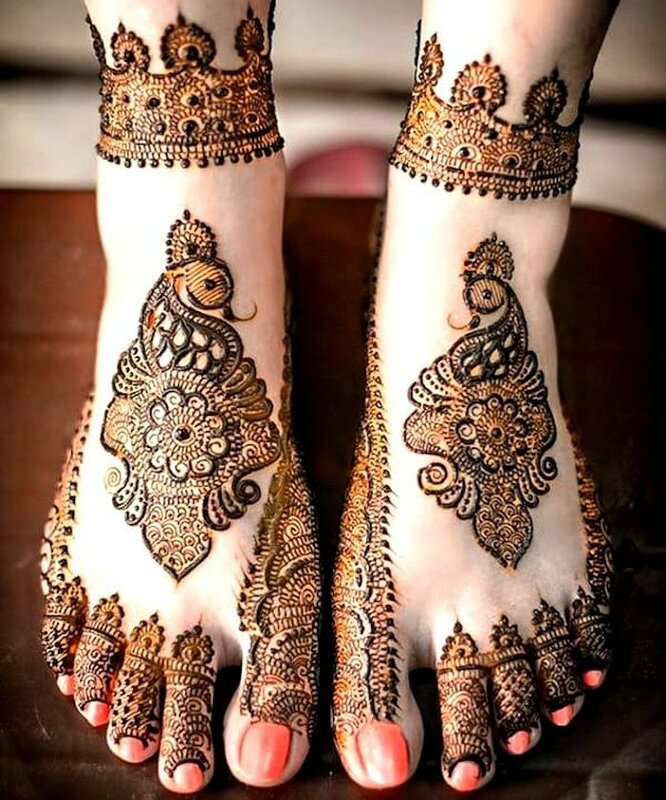 It is one of the best mehndi designs for legs. Another design pattern resembles an elephant’s trunk. This the Rani mehndi design like the bride only wants the Rani by her side including other design patterns. 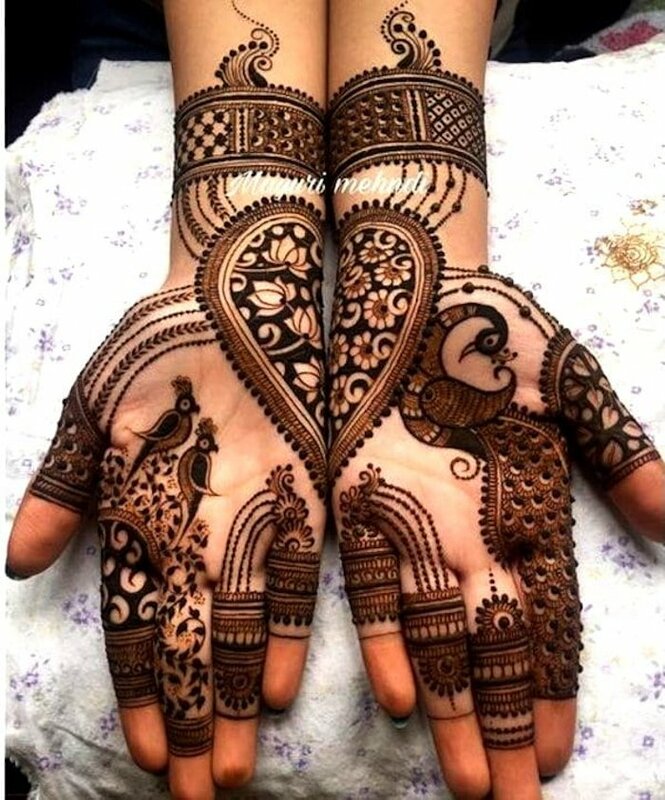 It is an intricate Indian mehndi design pattern with heart shapes. There is another design pattern also which looks like Diyas. Small Diyas in both hands. With bride’s smile, it is looking nice. 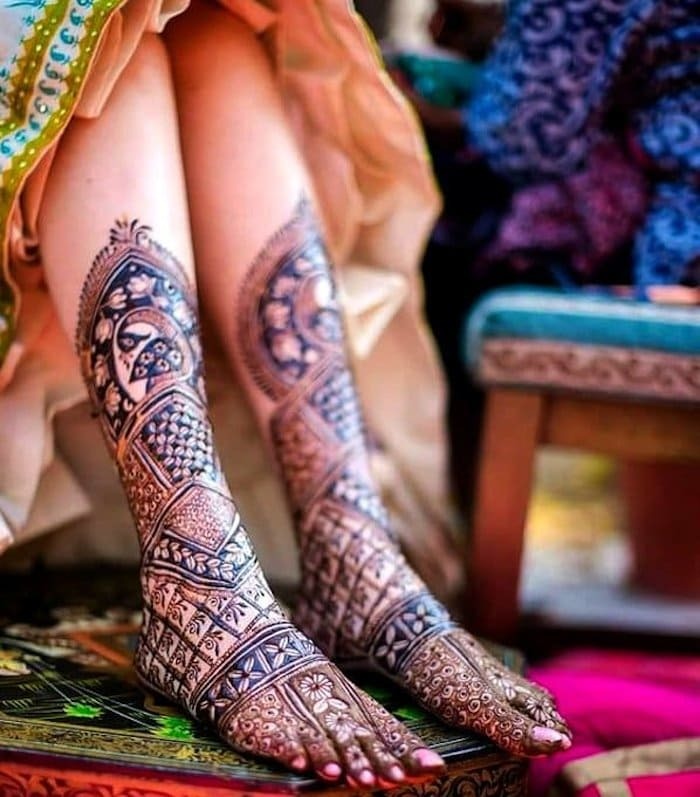 The center attraction of this mehndi design is Mandala and big chequered on both legs you can see. Other design pattern includes like a peacock’s feathers. Butterfly mehndi design pattern you can notice at the end of the hands. 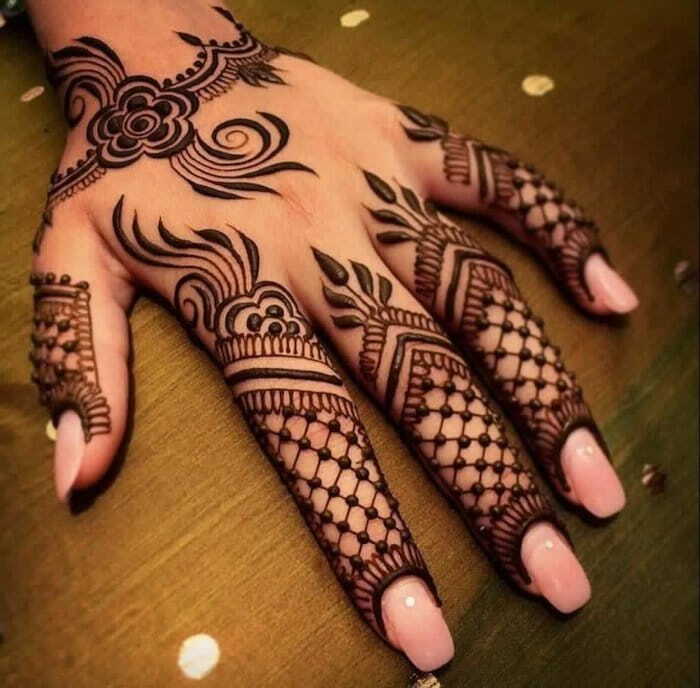 This mehndi design is giving the implication of like something rising upside. A kind of positivity which also reflects in this design. And the bride and groom both making wear each other rings. The golden nail polish is looking lovely with this color of mehndi and mehndi design pattern is totally intricate. Rose flower is the center attraction of this mehndi design. 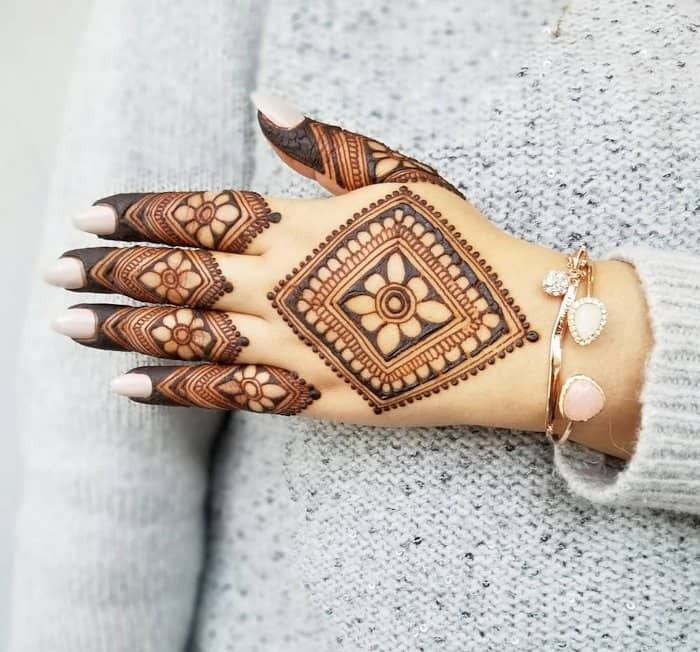 These days mandala design is trending and you can see in this hand mehndi design. 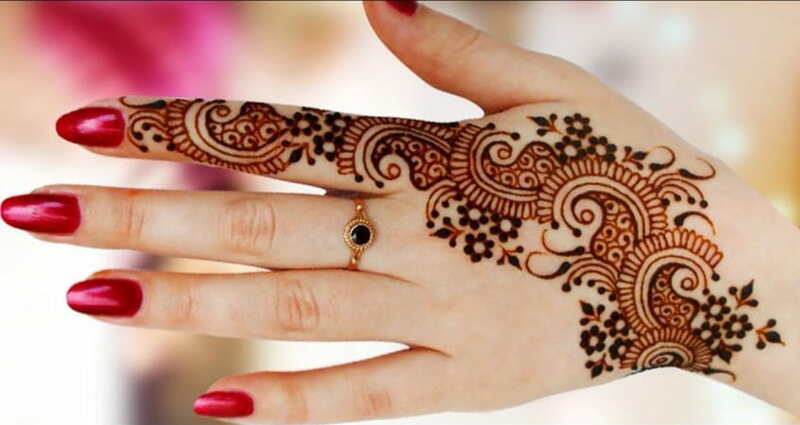 In fingers, the mehndi design seeming like the bride has worn a kind of ring through which so many chains are coming. 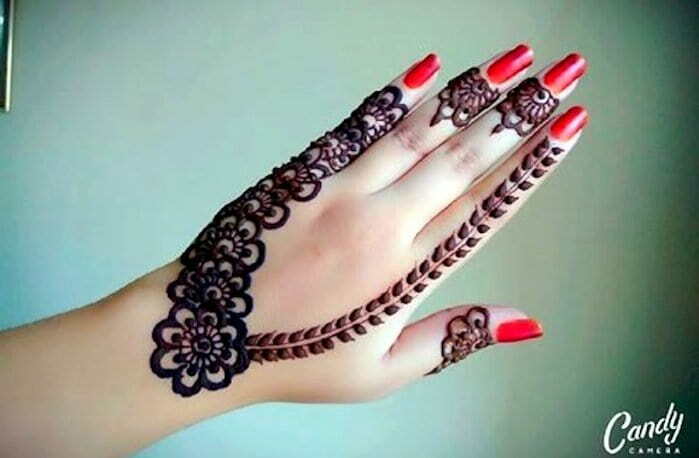 You can see flowers in this mehndi design and little simple it is. 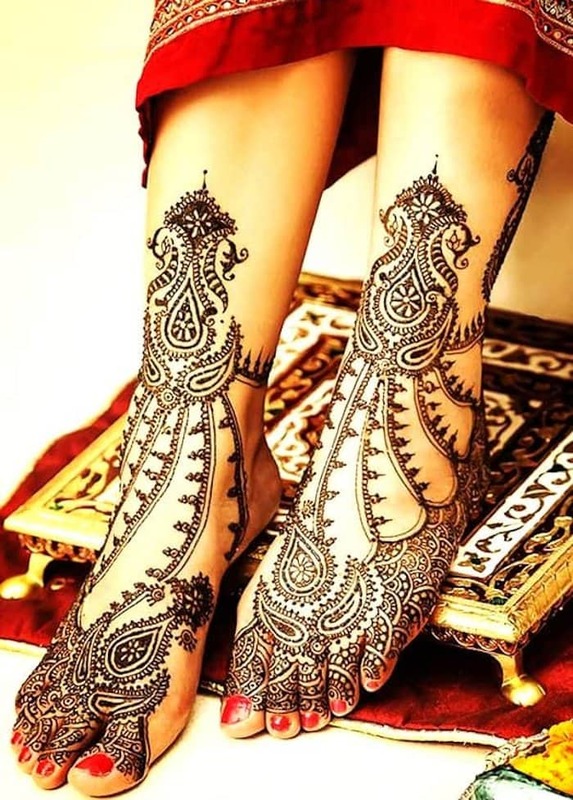 It is a simple mehndi design for legs and design pattern is like bordering the whole feet. It is a simple mandala design mehndi. This is a very intricate mehndi design pattern that takes lots of time to draw. It looks ravishing and feels like both hands wear a piece of jewelry like totally embellished. 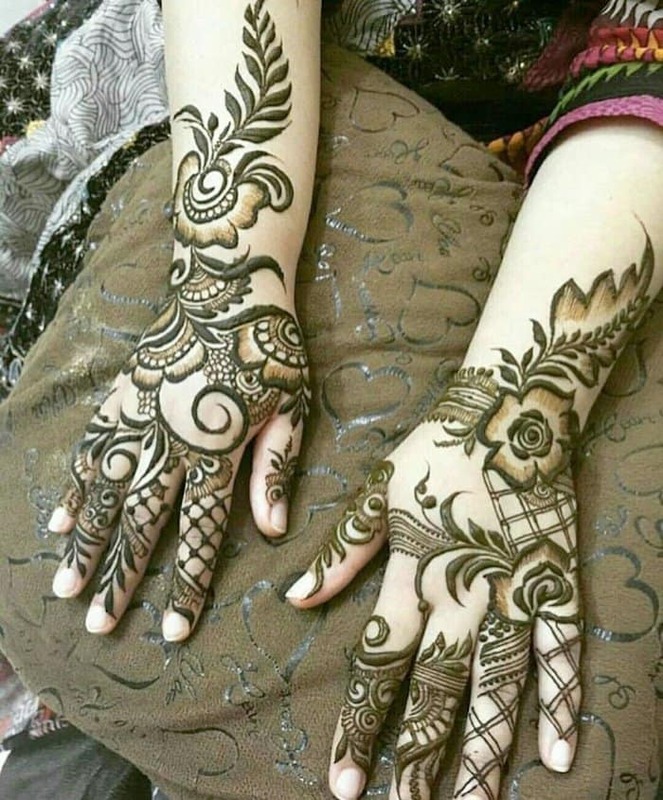 The flower pattern is the center attraction of this mehndi design. Chequered, flowers and small flowers, this mehndi design is the amalgamation of all these. It is full leg mehndi design including a peacock mehndi design pattern in it. Flowers are always there in mehndi designs and in this, we can see the beautiful use of dots design. And the flower is full grown including other small ones. 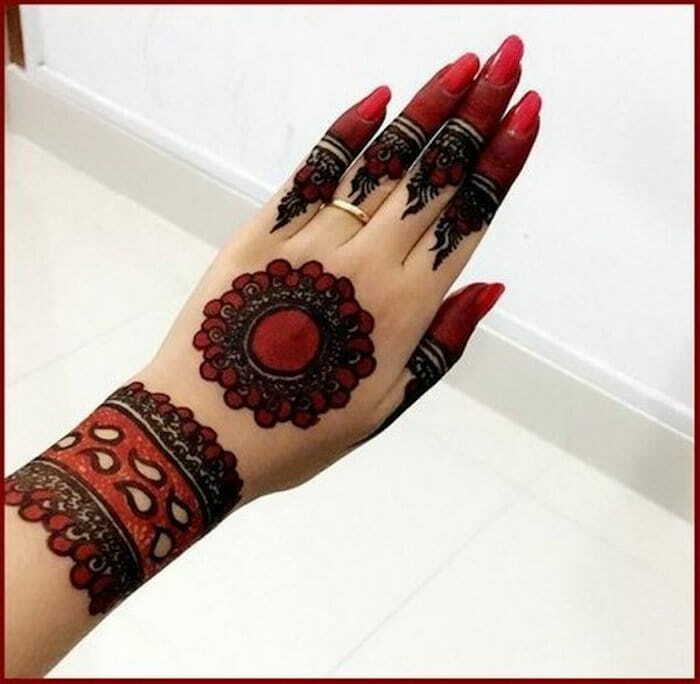 This mehndi design is giving the sense that it has originated from the center and so many curvy patterns in it that are going here and there. And around the border design pattern is looking like flames are rising. This mehndi design pattern looks like inspired from Mughal era and totally intricate work of art. 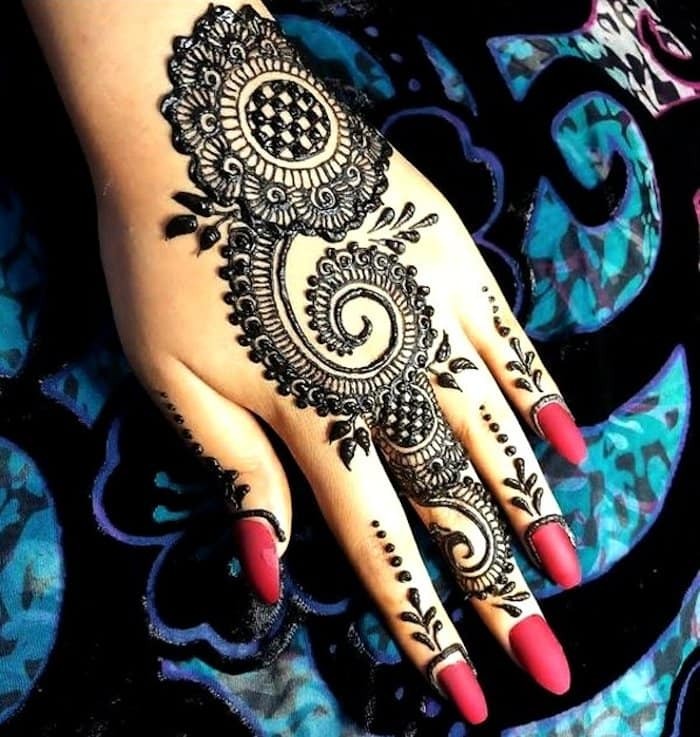 It looks like a traditional mehndi design and one of the most beautiful mehndi designs for hands. This mehndi looks like totally inspired from nature. There are various nature patterns in it and if you use this mehndi, it tells about you that you really love nature. So soothing and organized it is. Wanna add an oomph factor to your overall appearance? Give it a shot to chequered mehndi patterns and let your latest Mehndi design screams elegance. 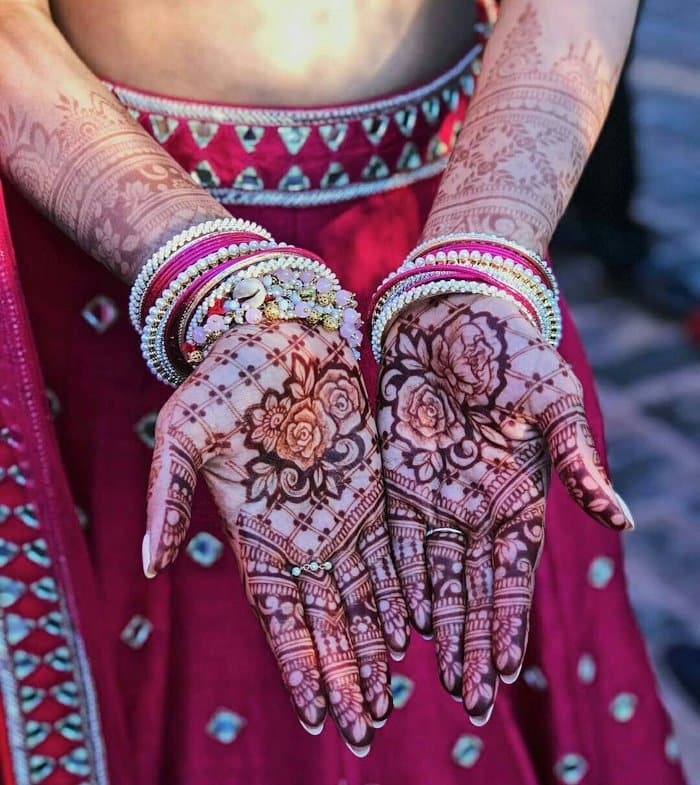 The beautiful and mushy hands of the bride covered in chequered mehndi patterns not only look stunning but also adds an unprecedented charm to the bride’s personality. 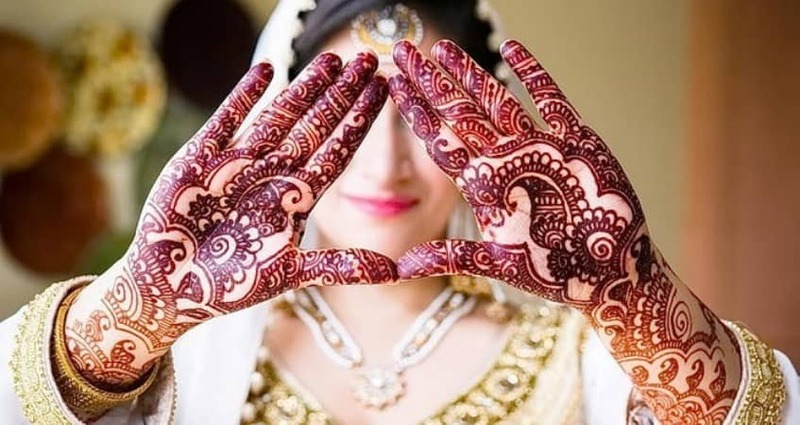 Check out the most ethereal selection of chequered mehndi designs below and pick the one that seems most drool-worthy. Colorful mehndi design it looks like and two colors of mehndi used in it. 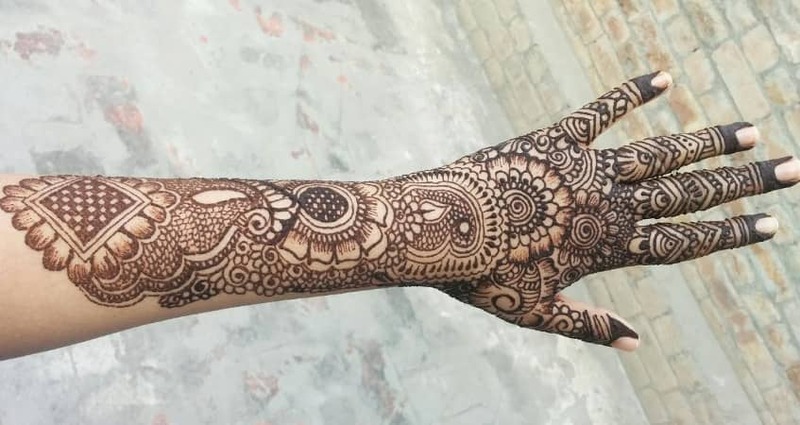 This mehndi design is giving the feel of the inauguration of something and so many curvy lines in this mehndi design pattern. Again the dots and small leaves mehndi design pattern you can see in it. Almost all design patterns are inspired by flowers and nature and different variation of it. Totally chequered mehndi design it is, takes a lot of time. And in this mehndi design there fish pattern design in it like swimming in the water. It is the Khafif mehndi design inspired from Mughal era and half of the pattern looks like rising flames and this design is giving the sense like you want perfection in your life. Every mehndi design that you choose reflects something about your personality and the aura you have. It is also a complex mehndi. 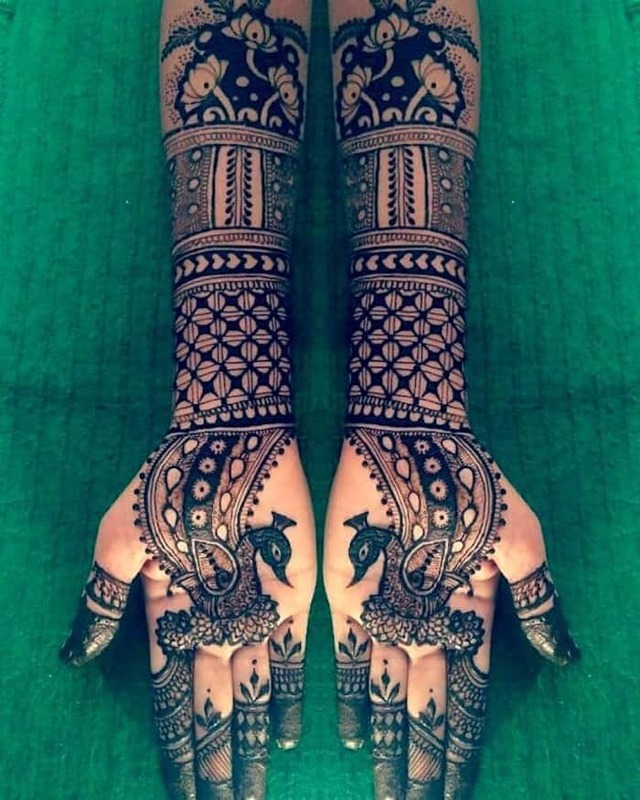 Almost all mehndi designs in this blog are complex. And its design looks like some embellishing jewelry. It is one of the best simple mehndi designs that can be easily drawn in less time. And it looks simply beautiful. It is the full leg mehndi design. It looks like your leg has worn a groom’s safa or turban. And little bit this design pattern resembles peacock’s feather around the leg’s fingers. 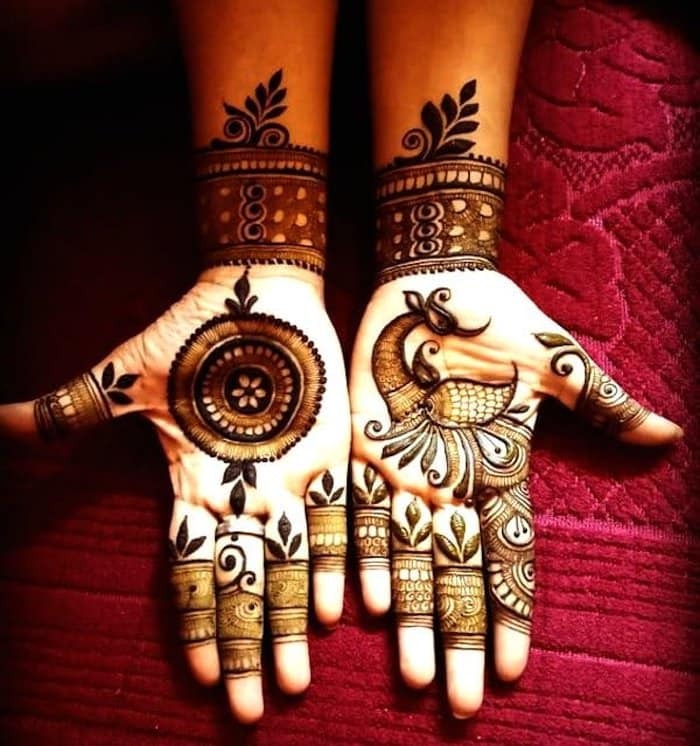 When it comes to the detailing, circular Mehandi designs are packed with utter magnificence and beauty. 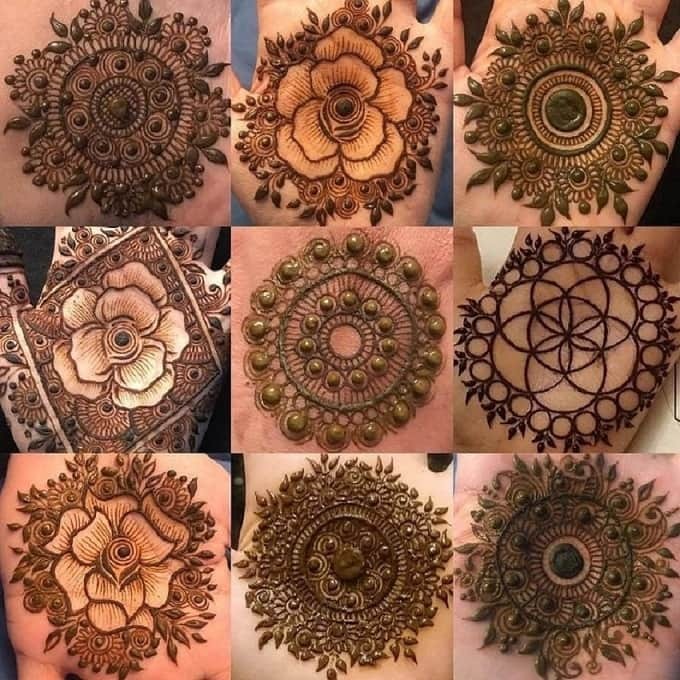 What makes circular mehndi patterns stand apart from the pack is intricate yet astonishing circular and mandala designs that make the Mehandi more compelling. 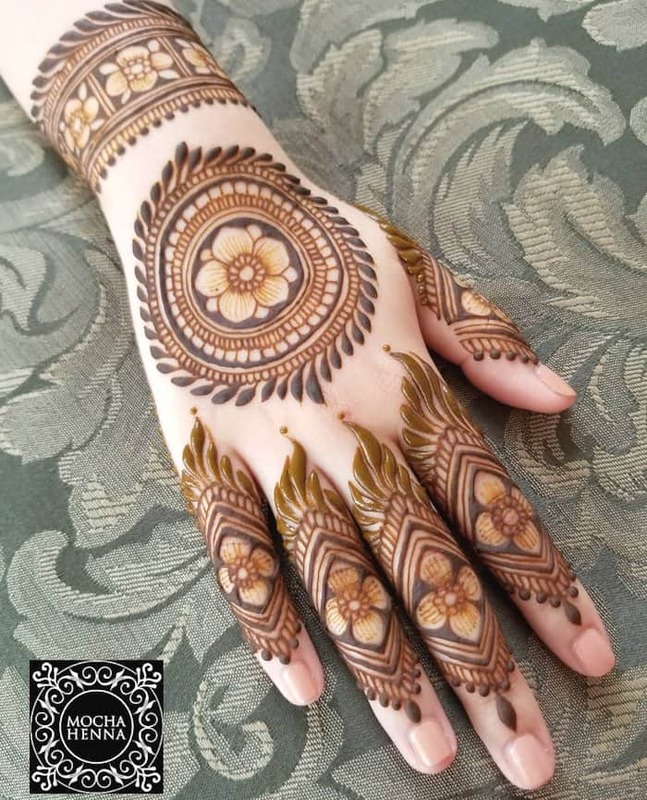 Furthermore, circular Mehandi designs encapsulate flowers, meaningful geometrical figures, leaves, and other patterns that you may have seen in day to day life. 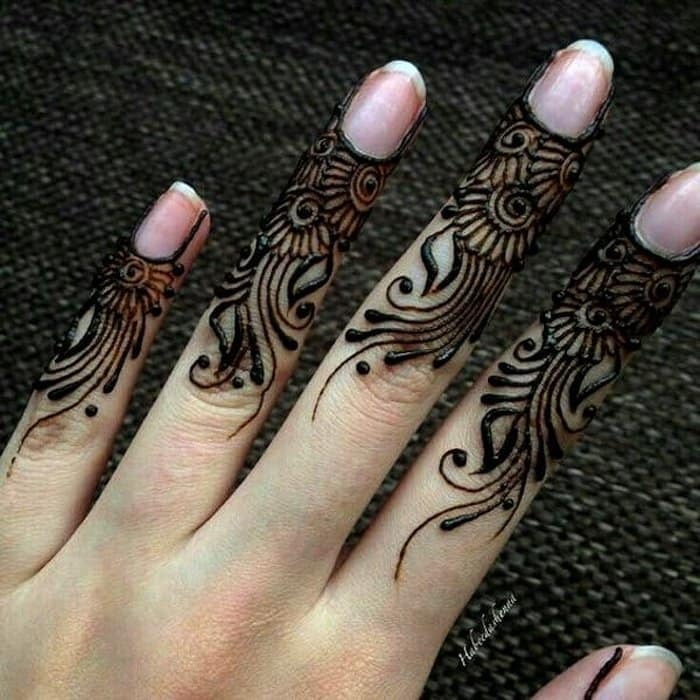 This is the character inspired mehndi design and one of the best simple mehndi design ideas. 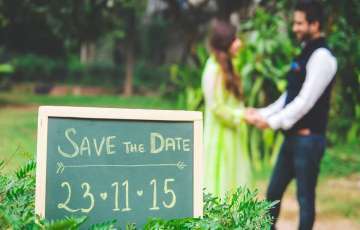 In the circular area, your picture of groom can also come, not exact but resembling. Simple yet beautiful this mehndi design pattern is. It is giving the feel that you don’t want any imperfection in your life and want to walk comfortably. It is a simple mehndi design pattern. It looks like a pendant your leg has worn and simple design around the area of leg’s fingers. This flower-flowers mehndi is giving the sense that you only want happiness in your life and nothing else. And yeah, every bride wants it. This mehndi design pattern is a combination of Khafif and Indian design. Though it soberly looks attractive. 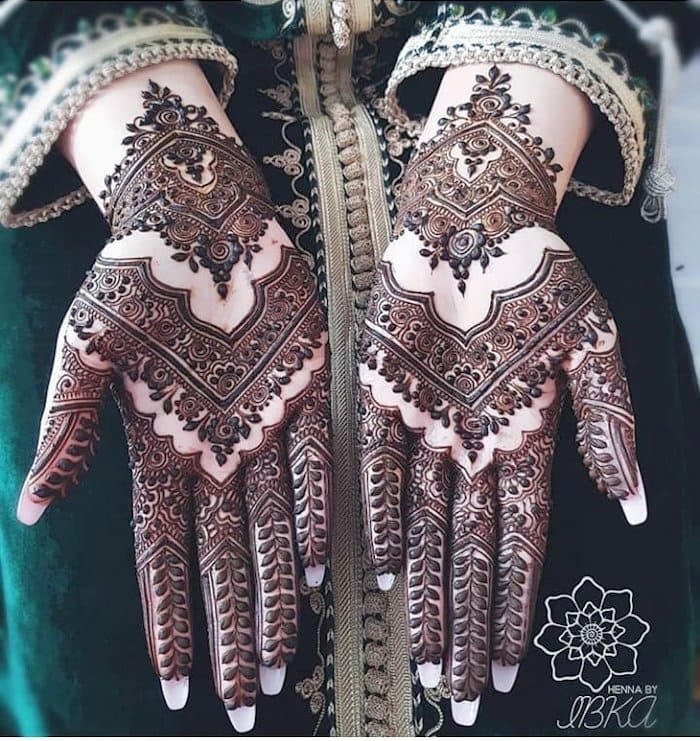 Seeing this mehndi looks like a dragon is flying in your hand and in both hands, it is different mehndi design patterns rather than a single one. 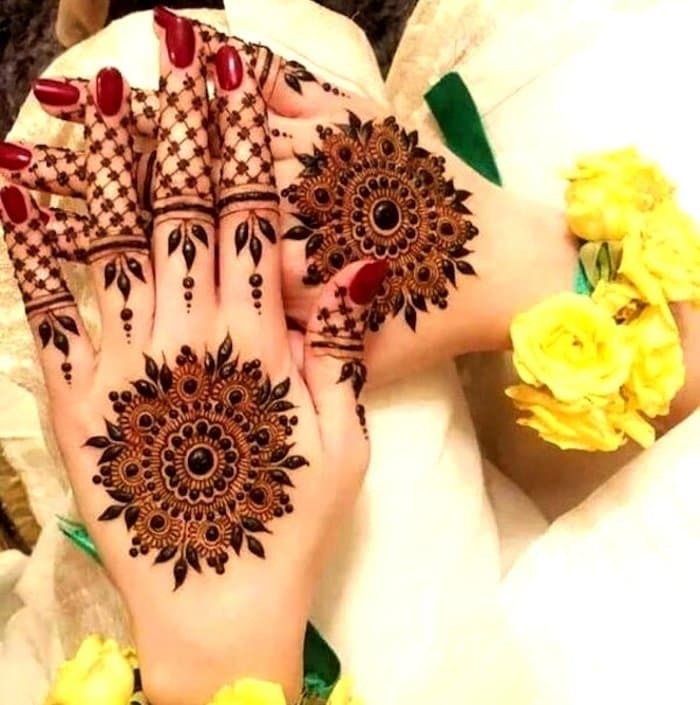 Simplest mehndi design it is and it is telling about you that you are satisfied with your life. You like you don’t want more and less. Balanced you want to go and want to enjoy everything. 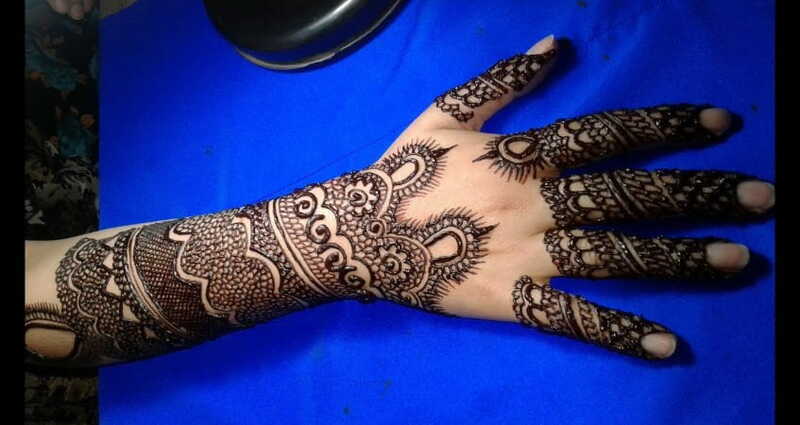 This type of Henna design is much popular in Rajasthan and other nearby states. The upgraded and modern version of the traditional Mehandi designs is colored Mehandi designs. This category of Mehandi designs is riding high on trends and perhaps the hot favorite among brides. The key aspect of colored mehndi patterns is the glitter in between the empty space that makes the Mehandi more vibrant, swoon-worthy, and attention-grabbing. You can choose the color for Mehandi that resonates with your attire. You can use the glitter too in your henna design like this bride has done with pink color if you want colorful mehndi. 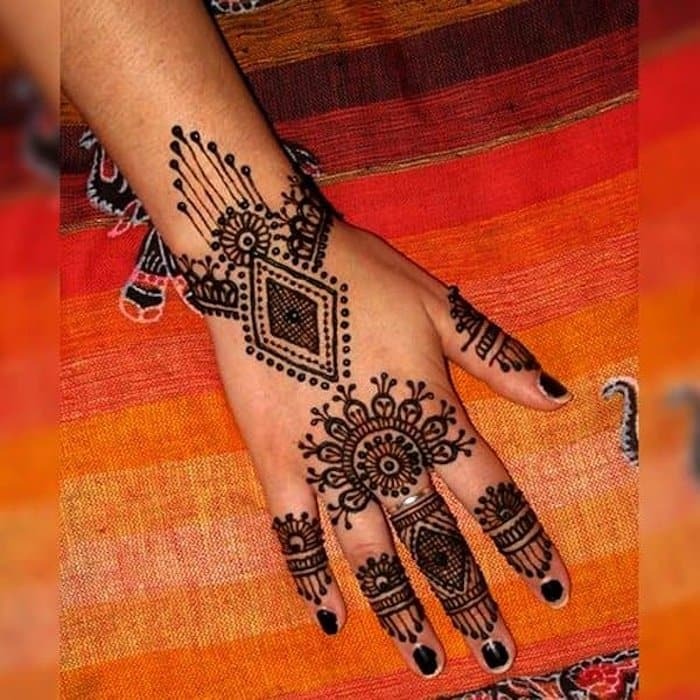 This henna design tells that you want everything in your life organized and arranged and a little bit secretive about your life. It is like colorful grass has grown on your legs and intense too. And this henna pattern tells about you that you are focused and want to focus on a single in a given time. It is one of the best examples of glitter mehndi ideas. 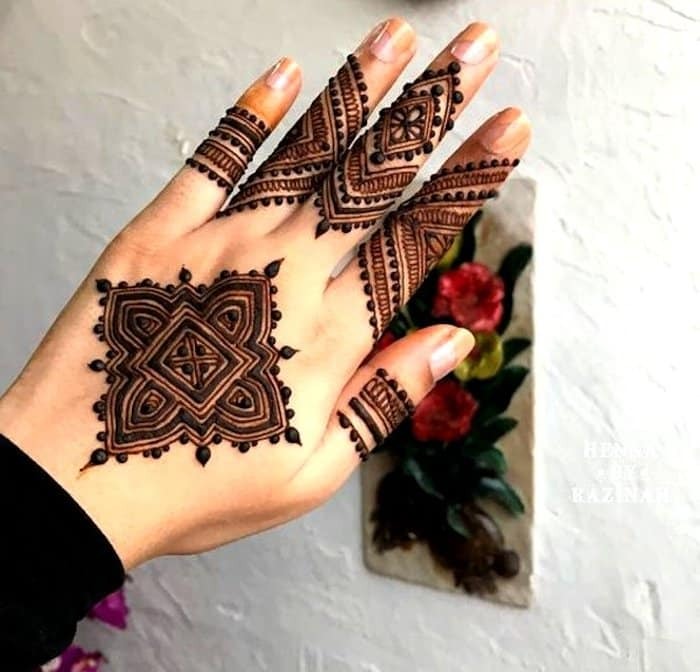 Not so much hotch-potch in this henna mehndi design and it is colorful too but be aware that there are imitation henna colors also coming in the market that can ruin your skin. so use wisely and use only branded mehndi. 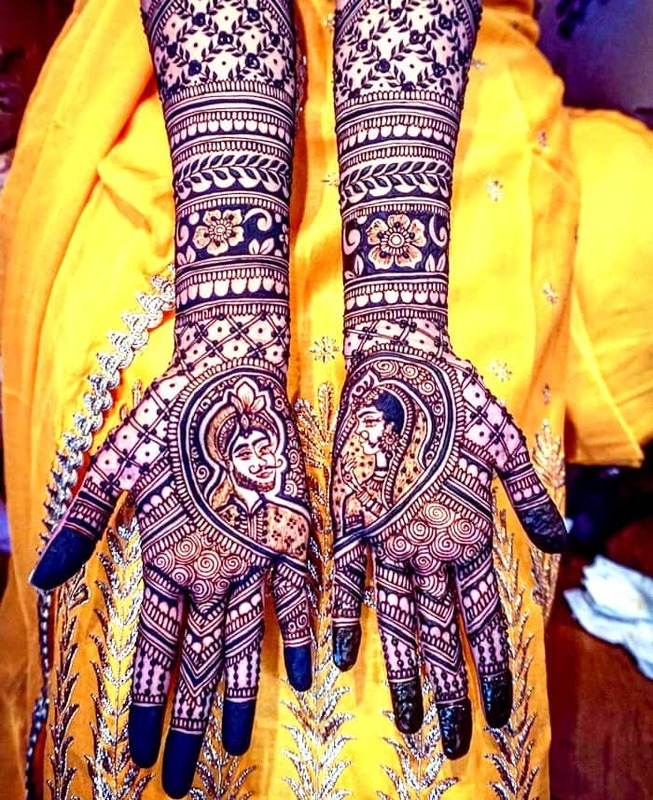 It is a totally colorful use of henna glitter and simple henna design idea that this bride has used. And this design pattern tells that you are ready for everything and everything you welcome in your life like ready for every opportunity. 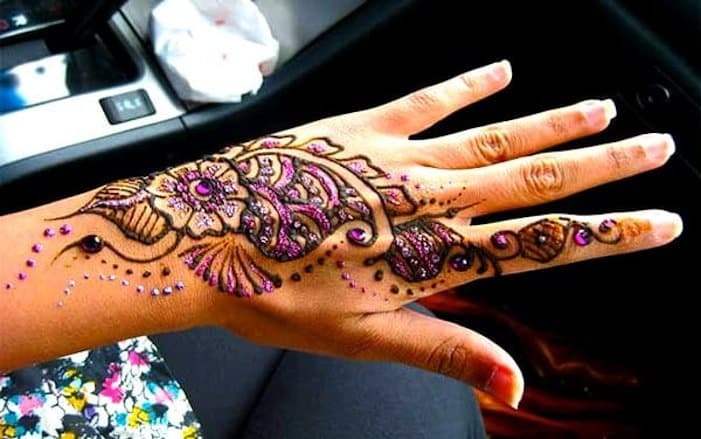 It is Arabic henna mehndi design with pink and silver glitter. It is the whole leaf design pattern with the flower in the middle of it. This mehndi, it looks like inspired from peacock’s feather color. So many colors are in there and butterfly design pattern in it too if you see it closely. 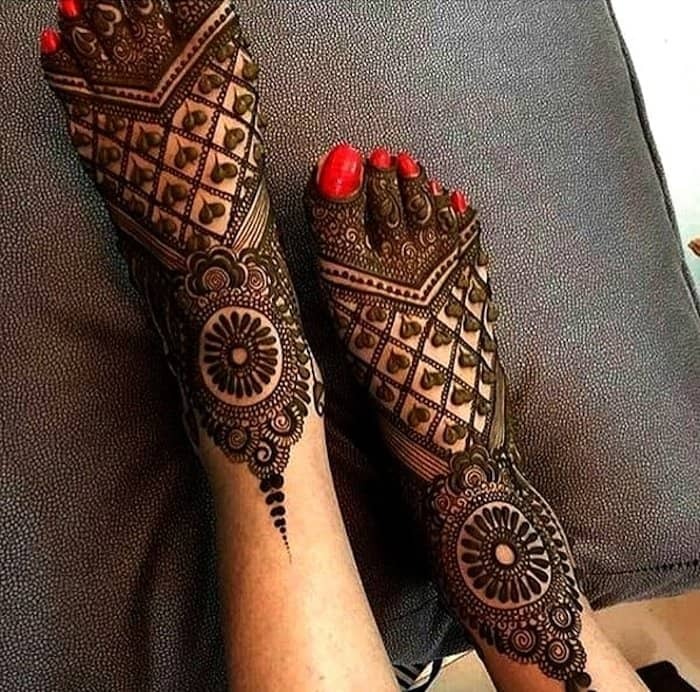 This is the simple Indian mehndi design and very much matches to those designs that women in Rajasthan’s villages usually draw on their hand and feet. The hand is looking red. This is the quality of the original mehndi. 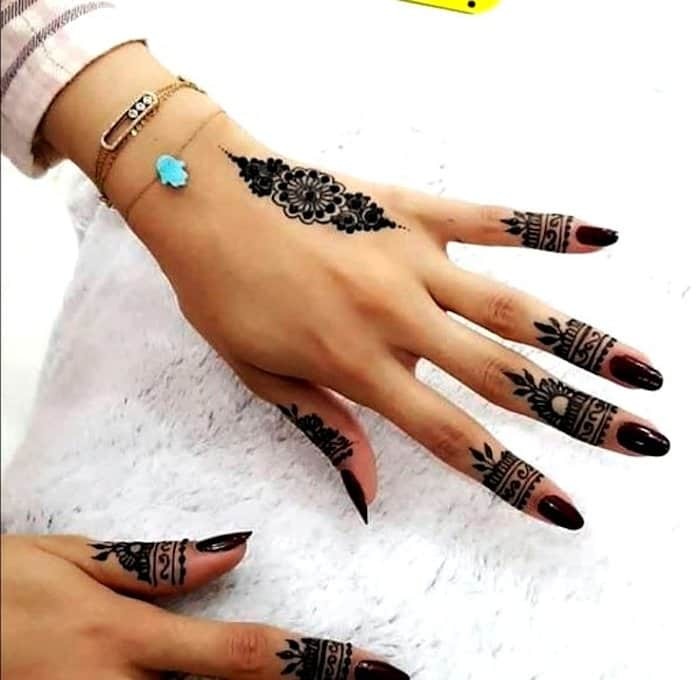 And mehndi design is also creative where you can see at the wrist’s side; little curvy wavy dots give the illusion of fishes swimming in water. And same at the border of it and in the middle a red flower blossoming. 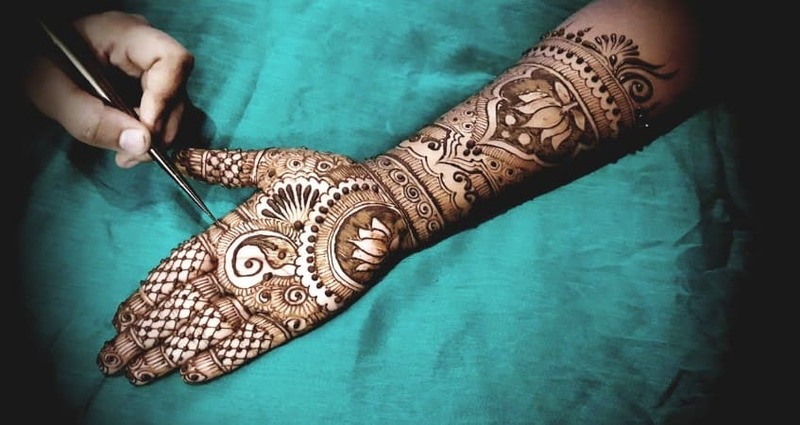 Also Check Our >> Seven Things That You Need To Know About Mehandi Artist Today! 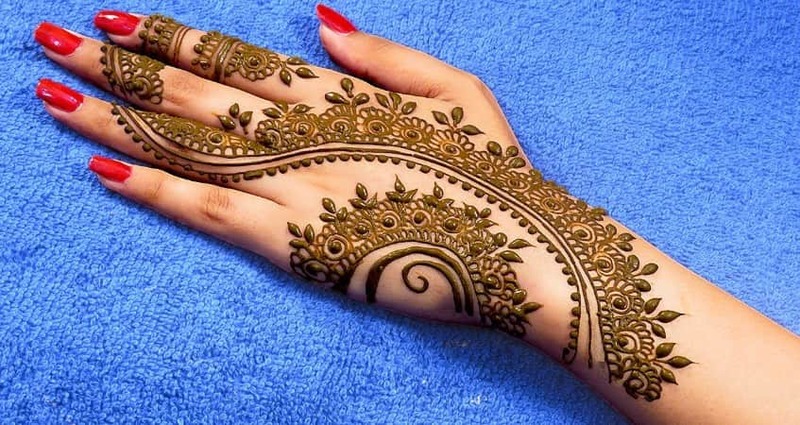 If you wish to get your Mehandi quickly done without compromising a bit in its beauty and designing, diamond Mehandi designs are surely for you ladies. 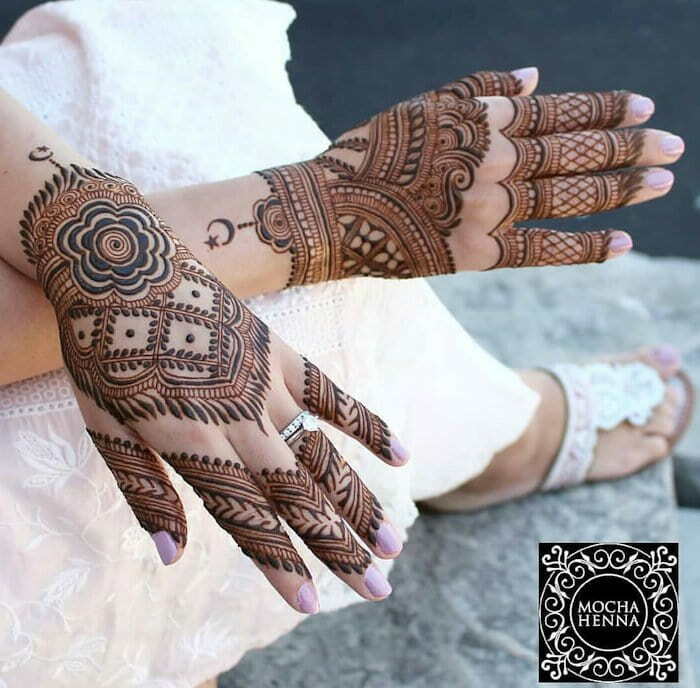 The roots of this Mehandi design lies in Asia and diamond Mehandi designs are one of those rare designs which can be created with effortlessness. 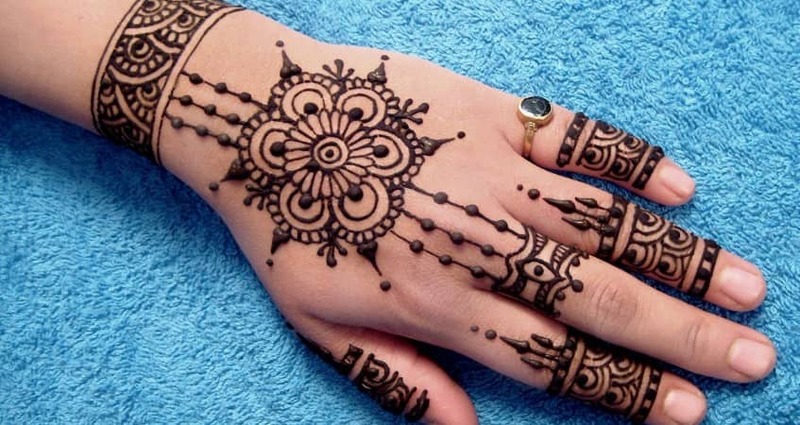 There is a lot of scopes for add-ons to beautify the appearance of Mehandi furthermore. This is also a simple mehndi design, not so much detailed and in the middle, there is a diamond shape. You can also call this mehndi design a western mehndi design. It is like designer hangings that we hang during the major festival like Diwali, Holi. 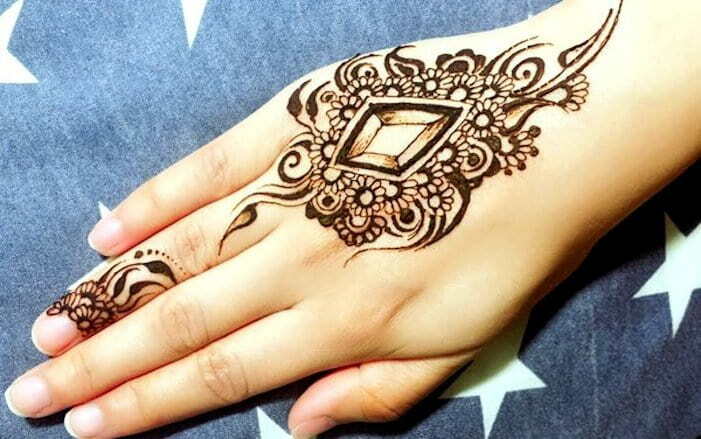 This mehndi design is like a diamond within a diamond. Extremely decorated though a simple mehndi it is. Several lines and dots are there and wavy curls and in the middle a rippling type of effect. This design is a very complex one and only one design which is in the middle. And around the fingers, it is like leaves growing. A kind of Arabic pattern. There is a chequered diamond in the middle and below from it three four lines that are spread seem like a small stream is flowing. Not so much hard work to do for a mehndi artist to do in this mehndi. 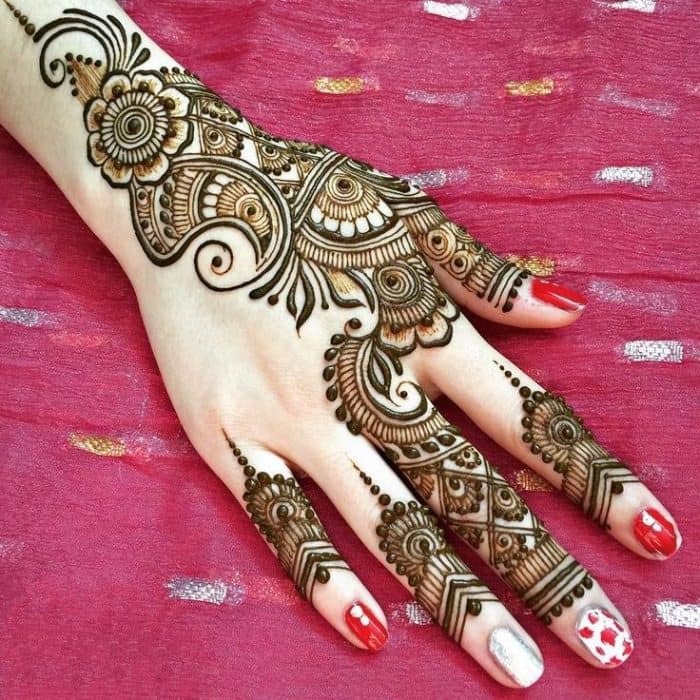 It is also a pattern of western mehndi design which is a combination of diamond and half diamond together. And around the fingers, it looks like tassels are hanging. 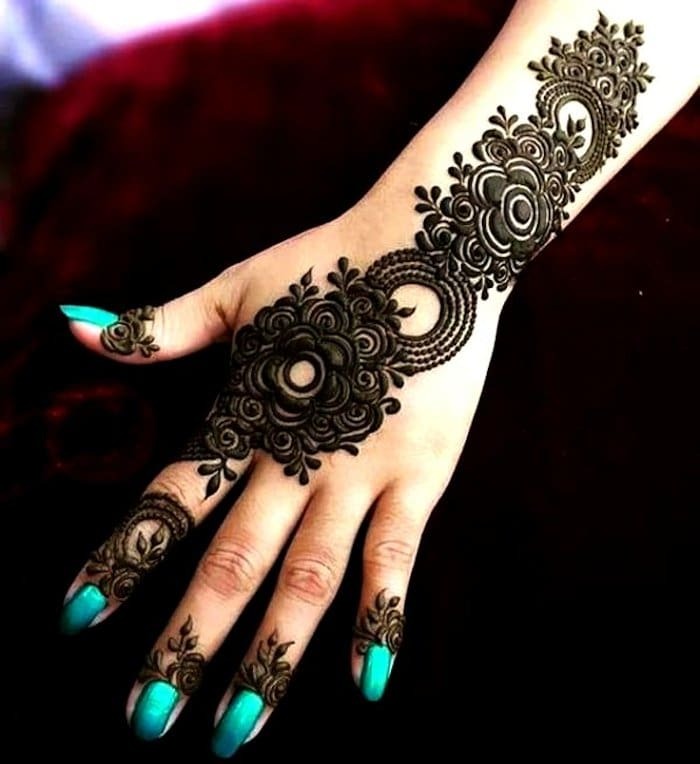 It is simply an Arabic mehndi design. 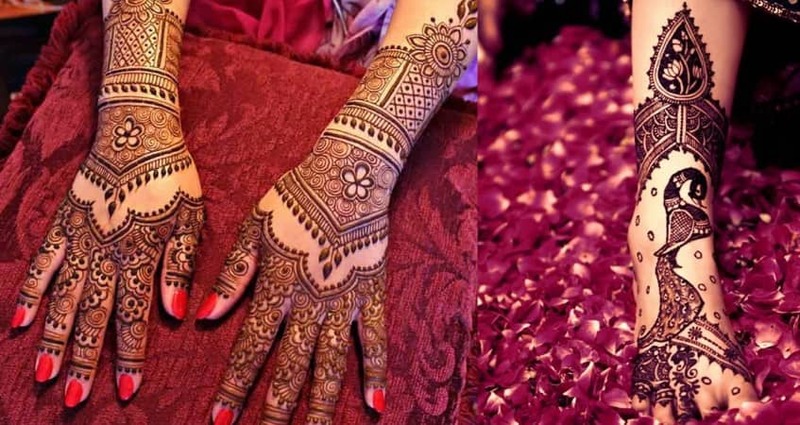 It is better for those brides who want to go minimalistic and don’t want to waste much time in mehndi mean for those who cannot give much sitting time for mehndi. This design is also inspired from design patterns that were drawn in the villages of Rajasthan. It is a kind of Rangoli pattern. Even you can draw yourself this mehndi design. 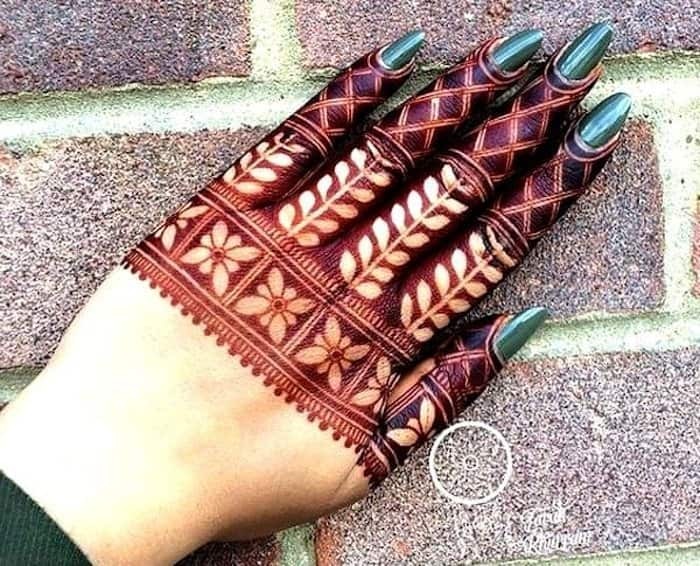 Arabic diamond mehndi design it is that is covering half of the hand starting from finger to going at the below of the wrist. It is like a Hathphool you have worn. 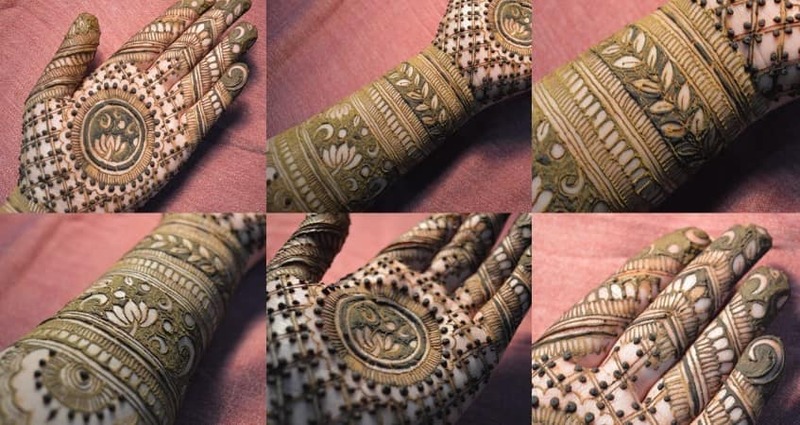 Finger Mehandi designs are the perfect amalgamation of simplicity, charm, and exquisiteness. 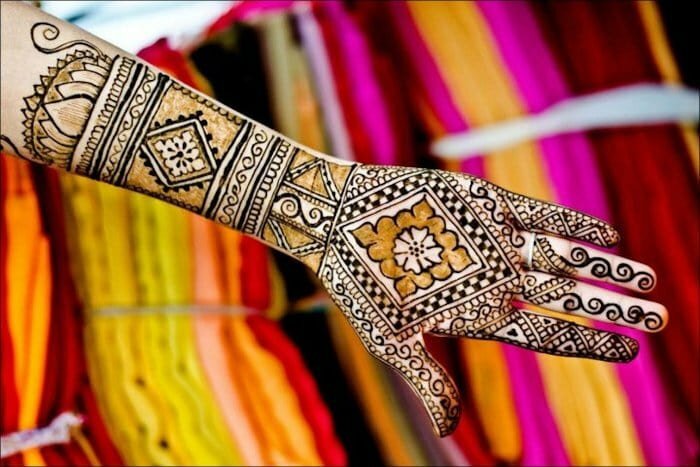 Majority of the Mehandi artists say that roots of this Mehandi designs lies in Pakistan and Arab countries. 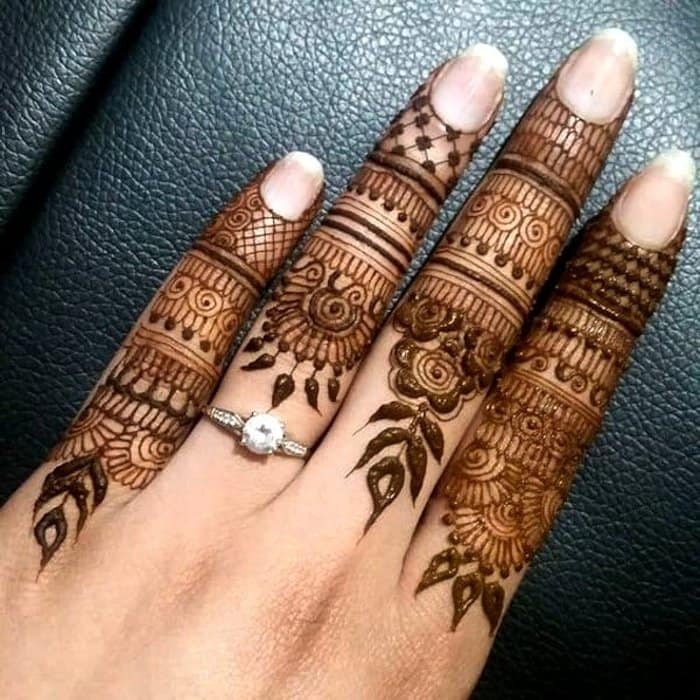 Some of the trendiest finger Mehandi designs are embellished Finger Mehandi designs, quarter finger Mehandi designs, Geometric designs, linear designs, Index finger band designs etc. Arabic mehndi design pattern again with a little mix of Indian. It is fusion. And this design is telling that you desire for selected beautiful things in your life. It is the DIY mehndi design. If somehow you could not book a mehndi artist then these types of designs can work for you. You yourself can draw it in your both hands. Only a little bit of attention you have to pay. 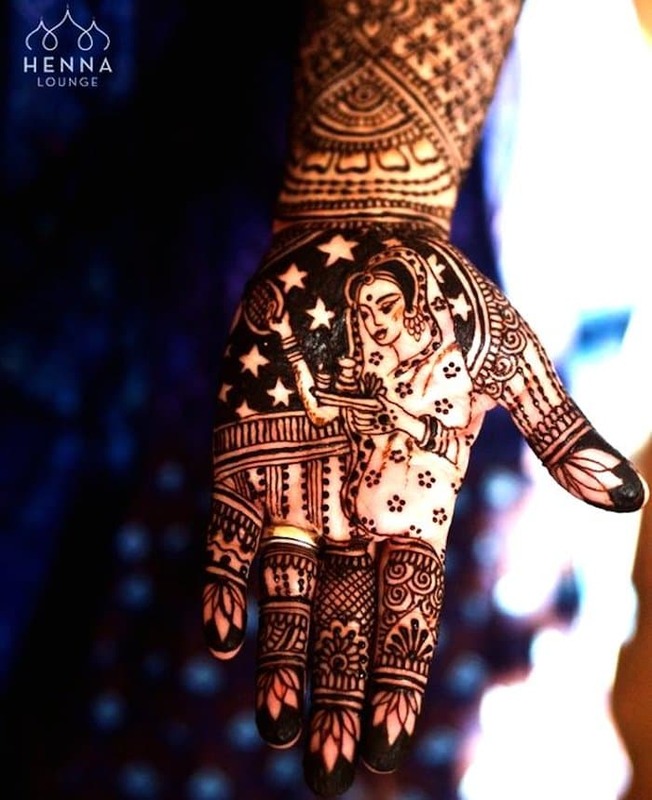 It is one of the most simple mehndi designs for hands. Leaves, flowers, and criss-cross mehndi design patterns are there in this mehndi and it is half painted. A creative experiment you can do for your wedding. This is also a DIY mehndi design that you without any hassle can draw yourself. 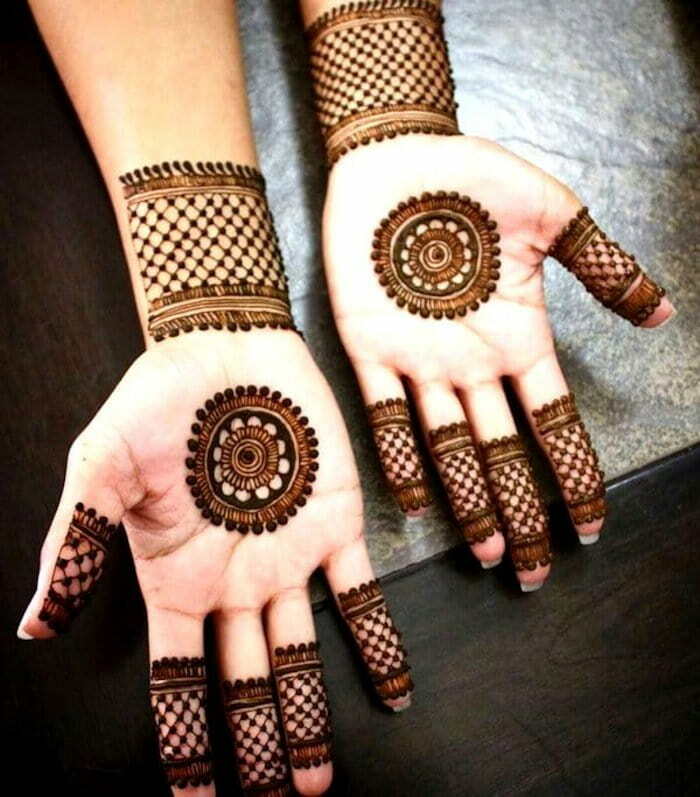 A pattern of Arabic mehndi design. And this mehndi design is like there are so many eyes seeing you. 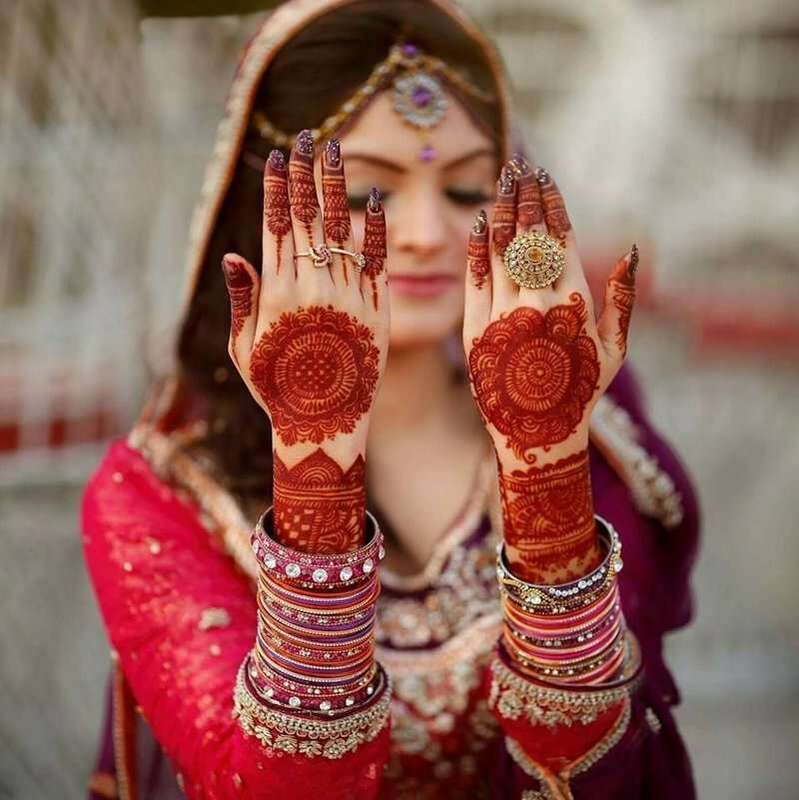 Some brides don’t want to paint their whole hands with mehndi. Only for Shagun, they want to do it. So this type of DIY mehndi design are better choice in emergency also if somehow you could not book a mehndi artist. This is also a simple mehndi design. It is like you have worn long rings in your fingers and of different patterns it is. 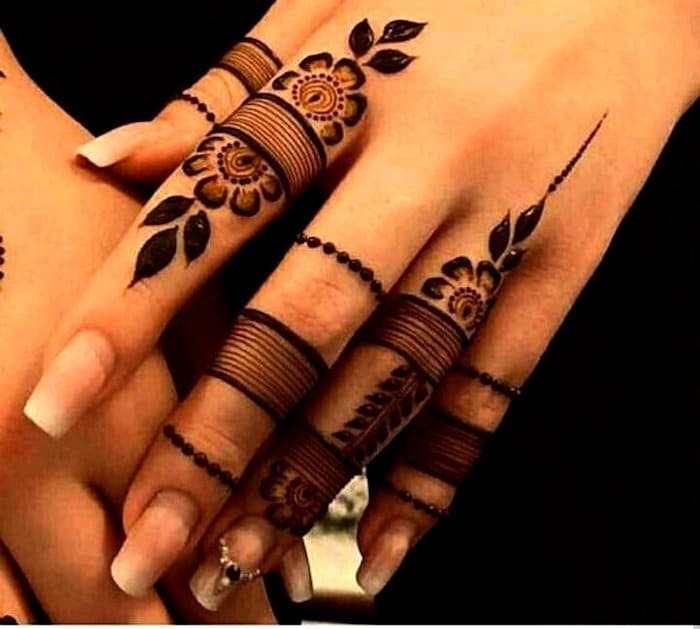 A mehndi design cannot be more simple than this and there is also bracelet design below the wrist. 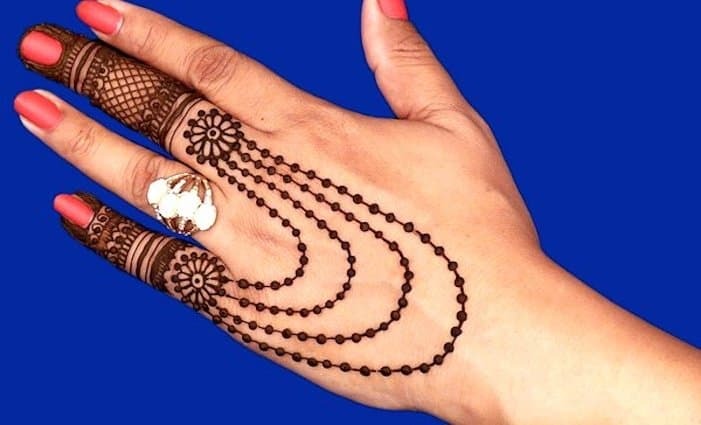 Bracelet mehndi designs are trending these days. There are several designs in it, which looks like real bracelets. You can use glitter too in it. 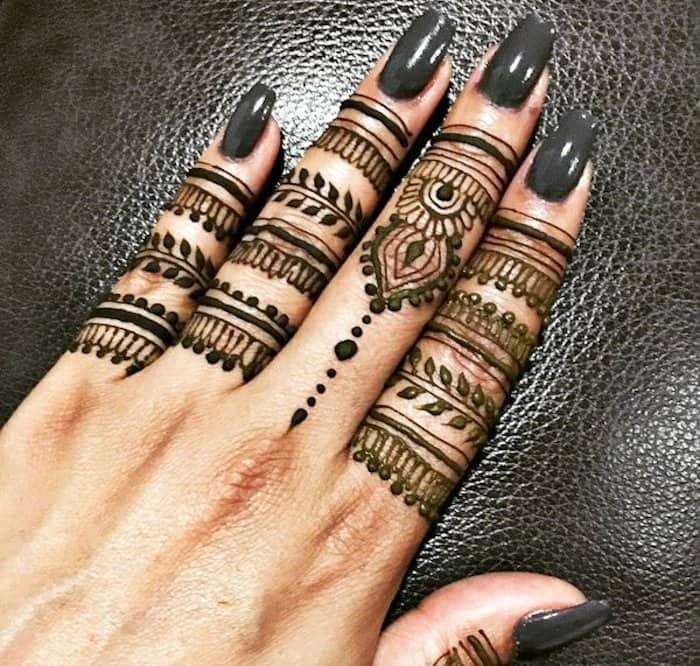 This mehndi design is like so many patterns of rings you have worn in your hand. Leaf ones, these are like wreath designs. 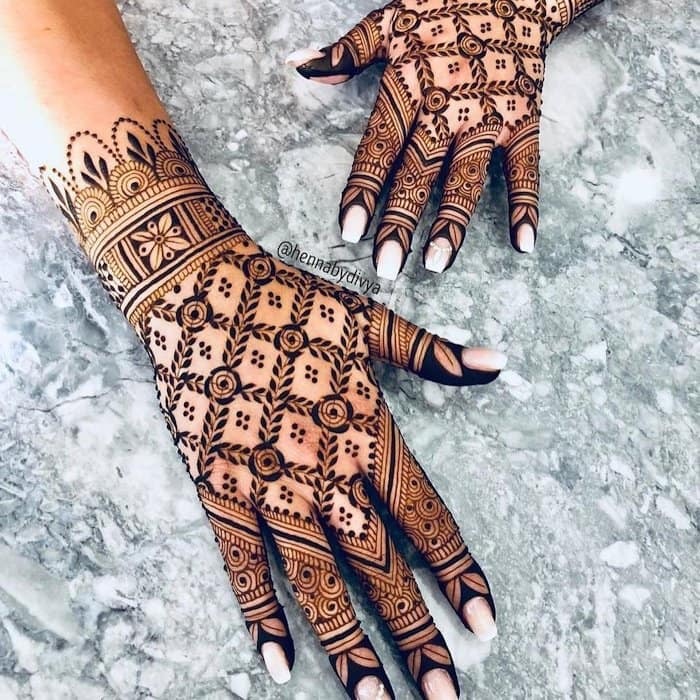 No matter what the occasion is, flower Mehandi designs are evergreen and such a strong rage among the women and teenage girls. Flowers are the symbol of love, delicacy, sweetness, and femininity. 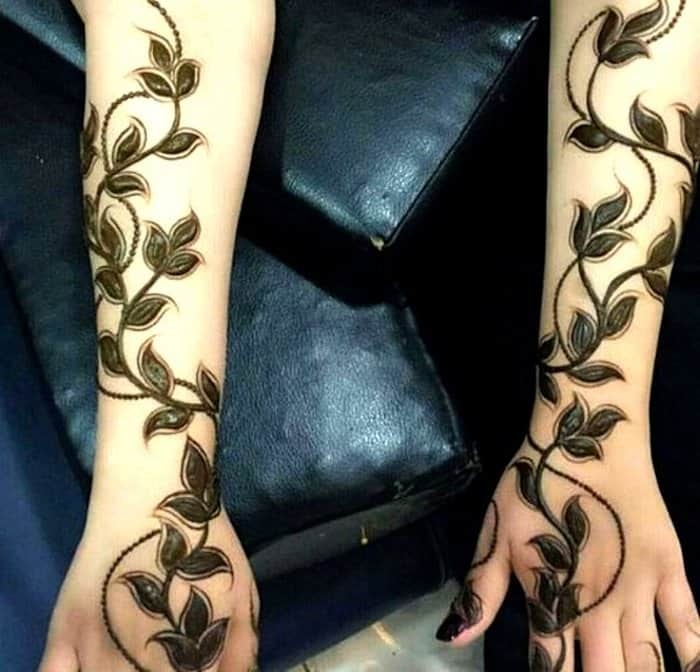 Similarly, you can ask Mehandi artist to produce drop-dead gorgeous flower Mehandi design that expresses your love and passion for the better half. 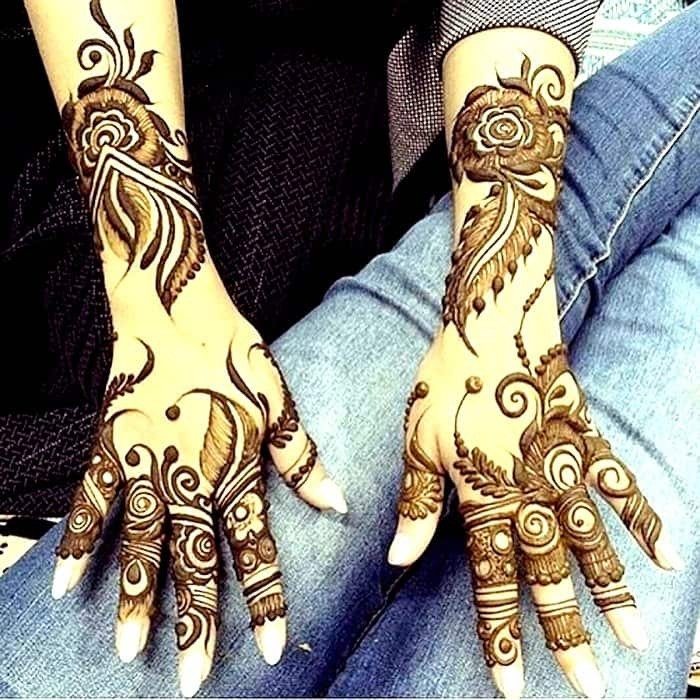 This is Arabic henna mehndi design which has covered your hand in a way that looks balanced. It is an intricate design. It is a lotus henna design that is in the middle of a designed circle. 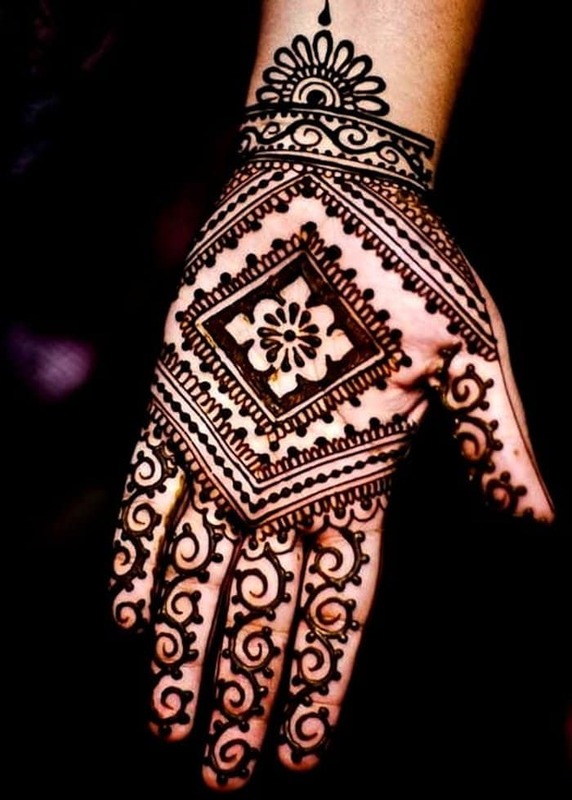 And there is no any other henna design around it which makes it drool-worthy. 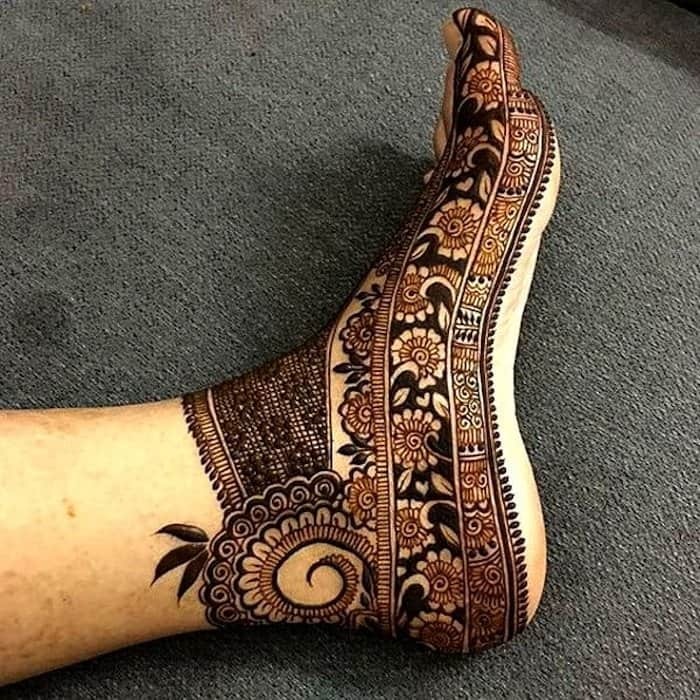 A classic mehndi design it is and exquisite too which is on leg. It is good that the mehndi artist draws this design on the front of leg provided eyes can go there. 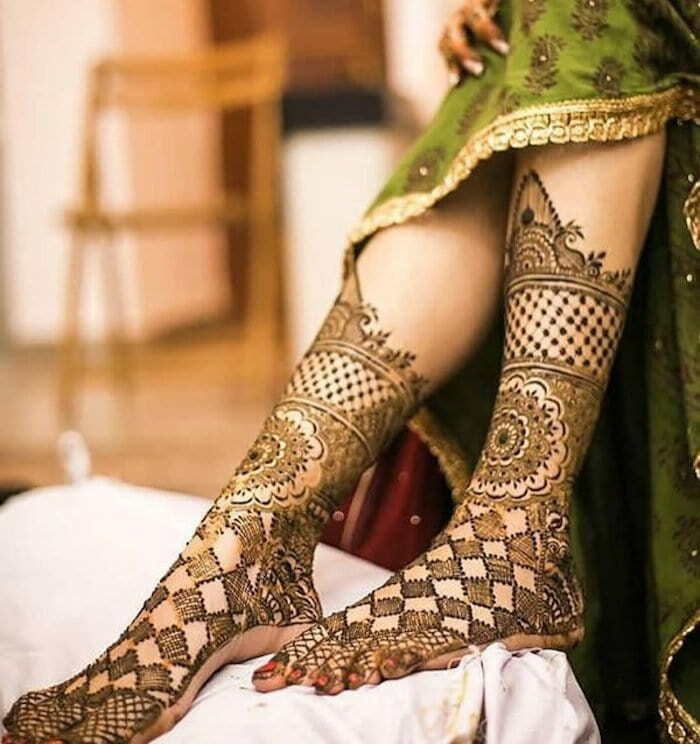 Mostly brides go for full leg mehndi which is no use because of half portion of their leg where mehndi is gets covered in lehenga or any wedding dress. 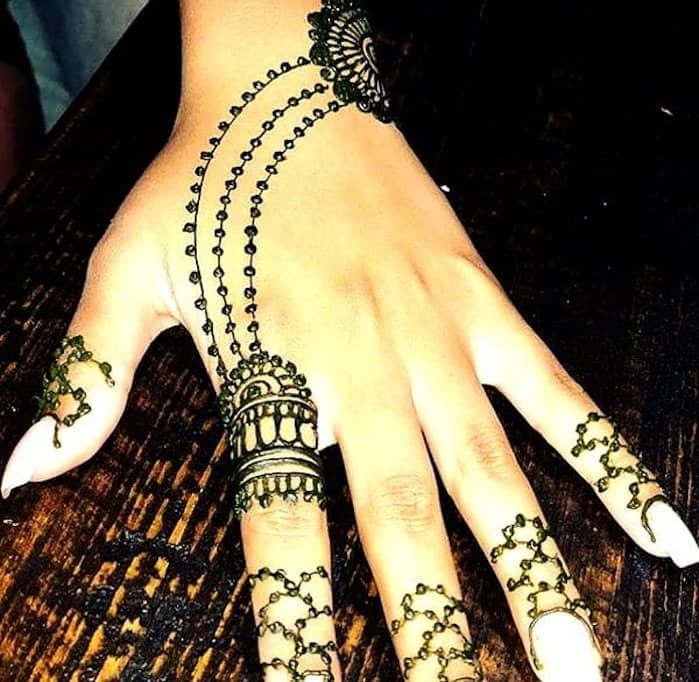 This is an exquisite Arabic henna design that takes time and for this, your henna artist should be experienced. 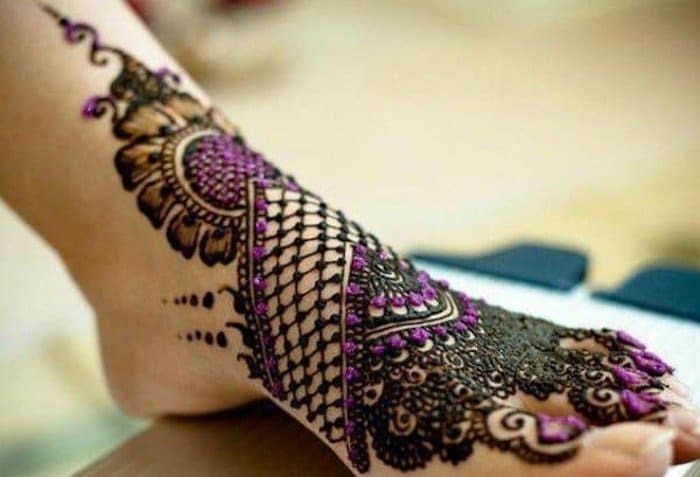 This leg henna design is like your leg has worn a kind of designer shoe, totally embellished with various flower designs. 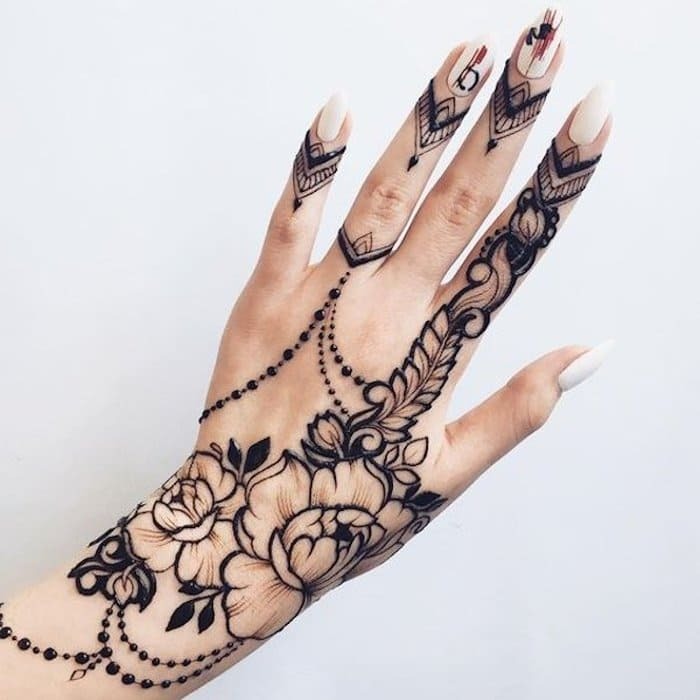 This henna design is like a flower has bloomed from its roots and it is Arabic inspired from Mughal era. 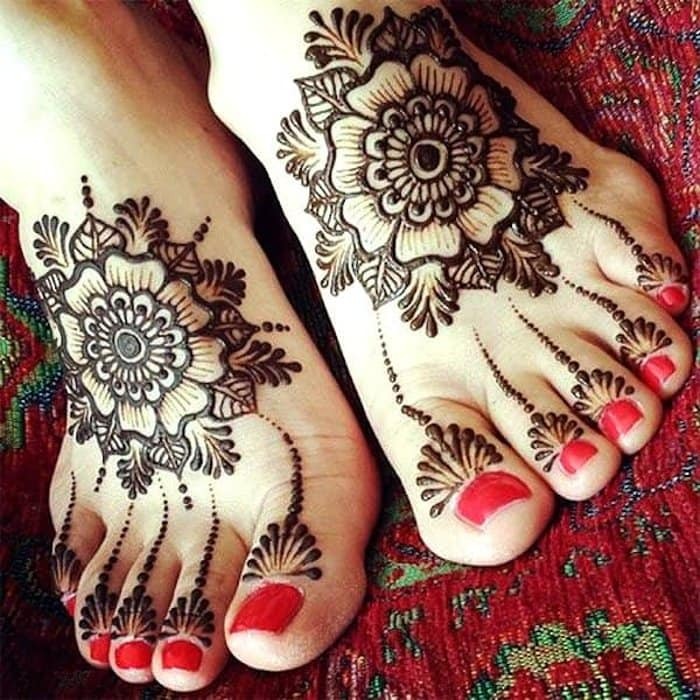 It is the flower henna patter in the middle of feet and from the fingers creepers are assimilating into the flower. For this kind of mehndi, you need an experienced mehndi artist. 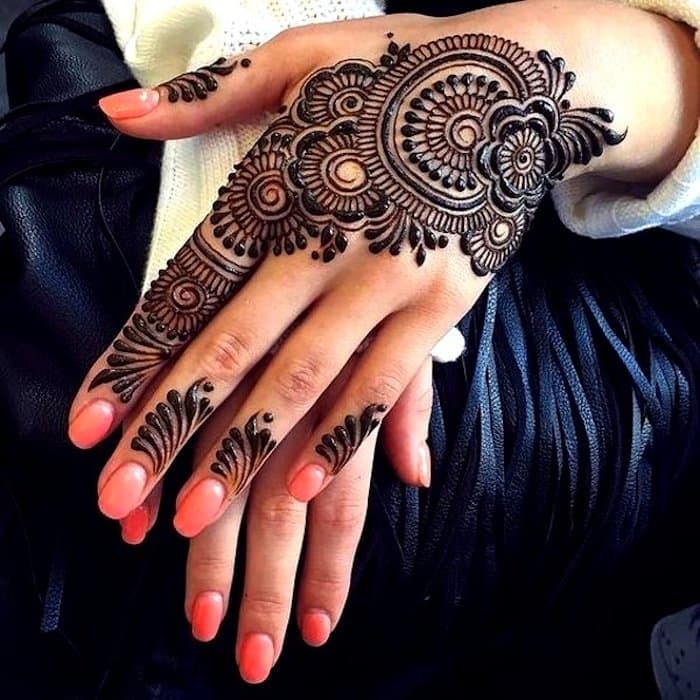 Henna design like this is giving the feel that you want to accept life in full glory. Have you seen the creepers that go long and little flowers come out from them. They look beautiful. 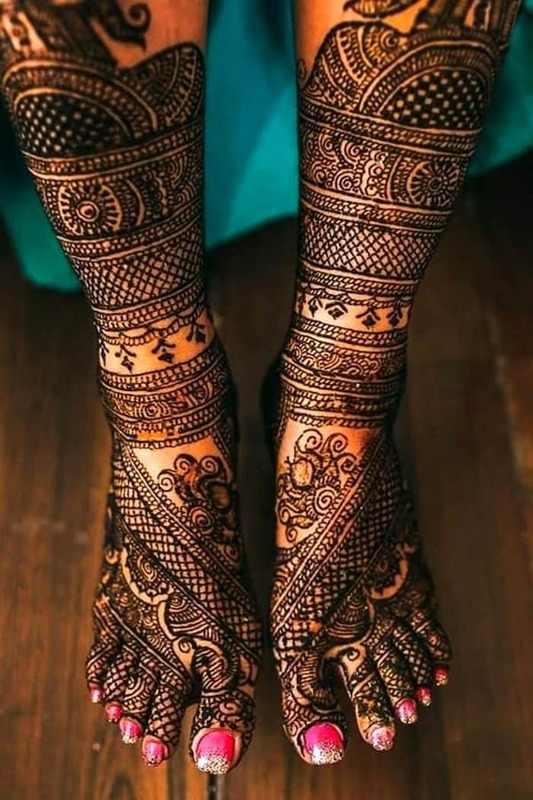 Same is this mehndi design where it is looking like creepers have covered the whole legs beautifully. The significance of Karva Chauth festival for women is simply inexplicable in the words. 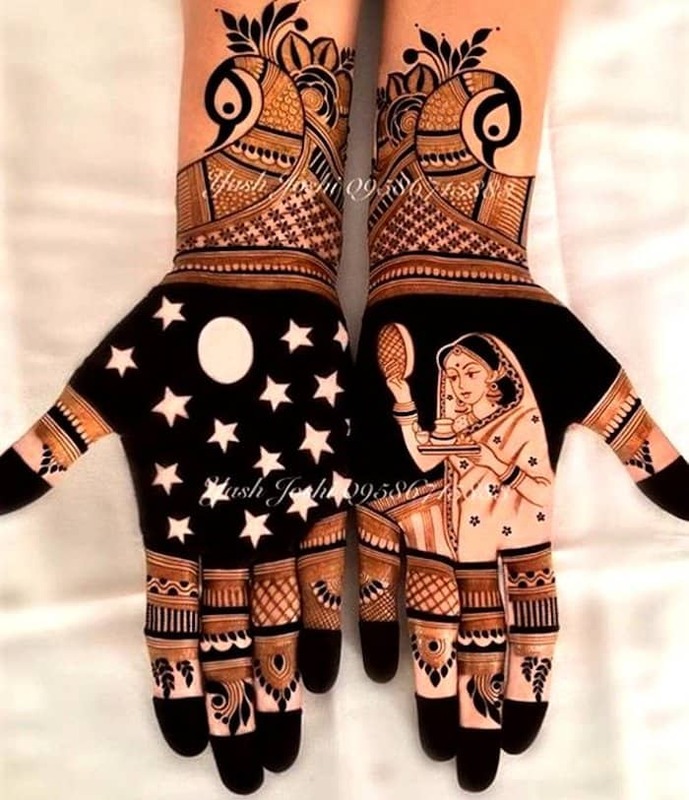 All the married women who perform fast for their husbands at Karva Chauth apply Mehandi for the long-life and unimaginable success of the husband. Karva Chauth Mehandi designs are super intricate but at the same defy all the definitions of the elegance and graciousness. 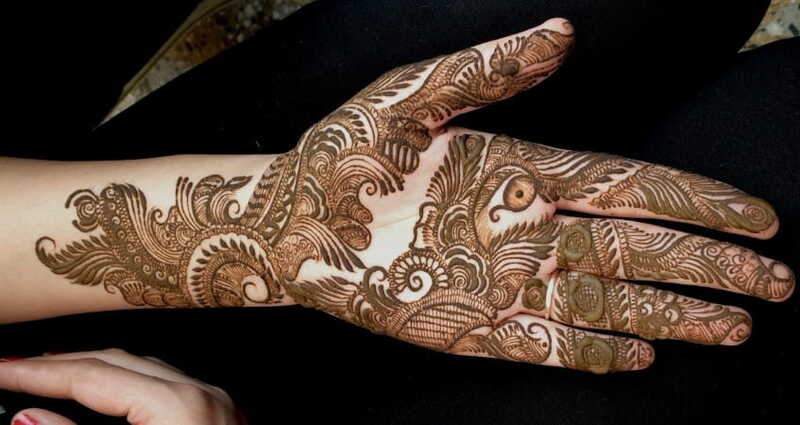 Many of the Karva Chauth designs are similar to Arabic Mehandi designs except for the style and degree of complexity. 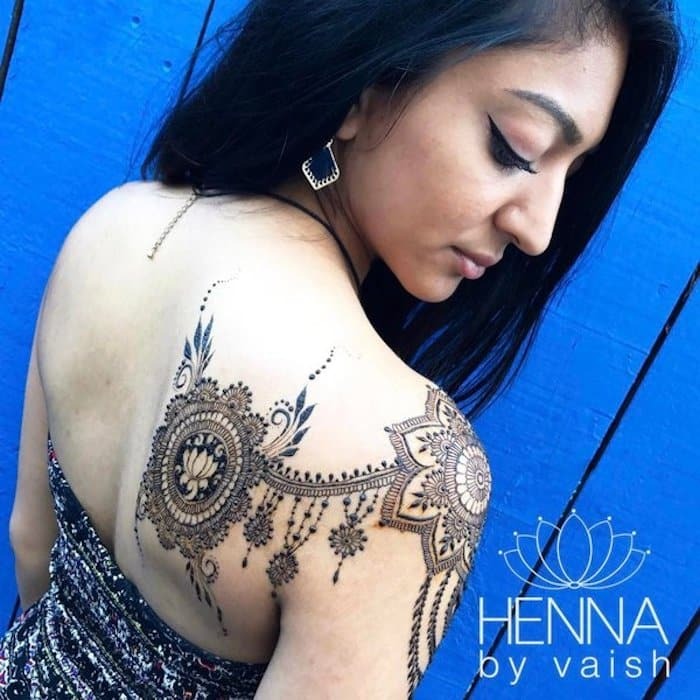 The character henna designs are in vogue. Any of your favorite character like cartoons and animals. 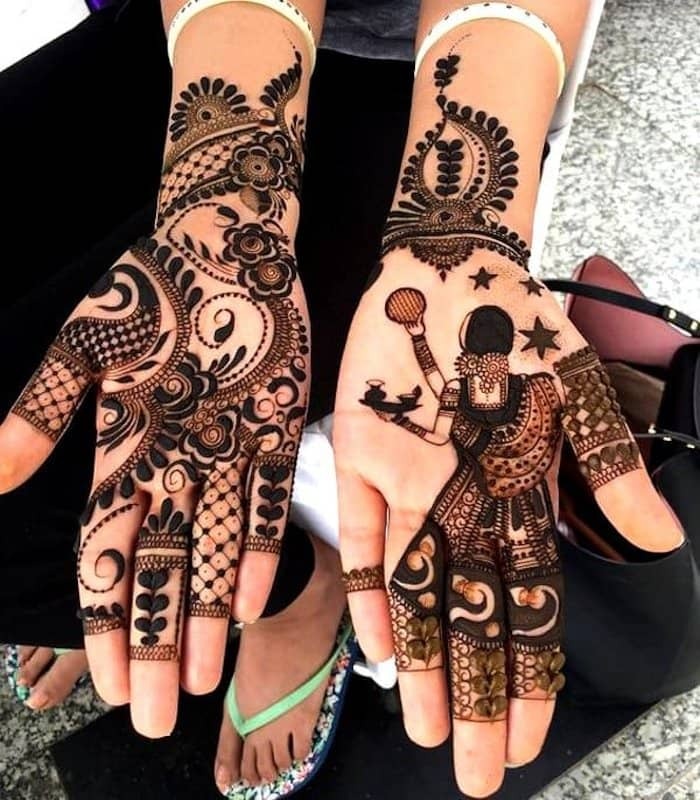 The default ones are also there depicting any ceremony like this henna design is where a girl has drawn doing Karvachaut. Stars in the sky wearing flower saree. 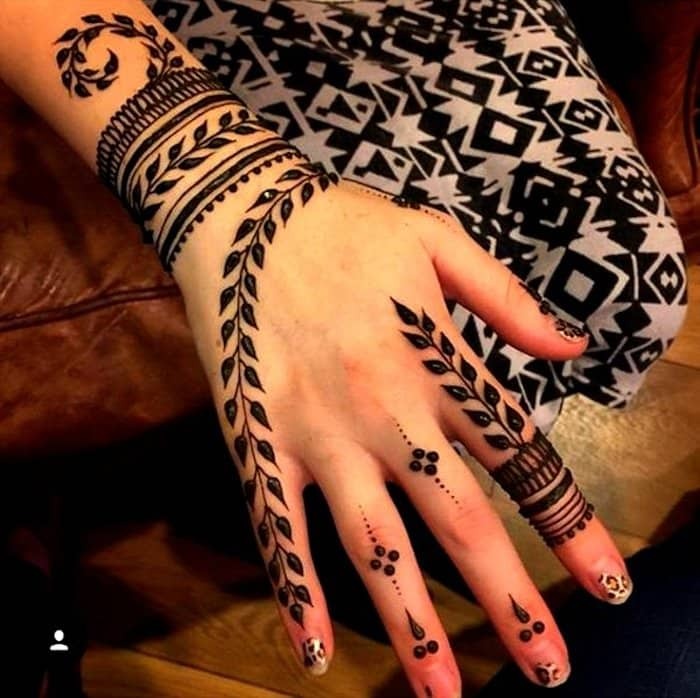 This Henna design is a fine print of art. 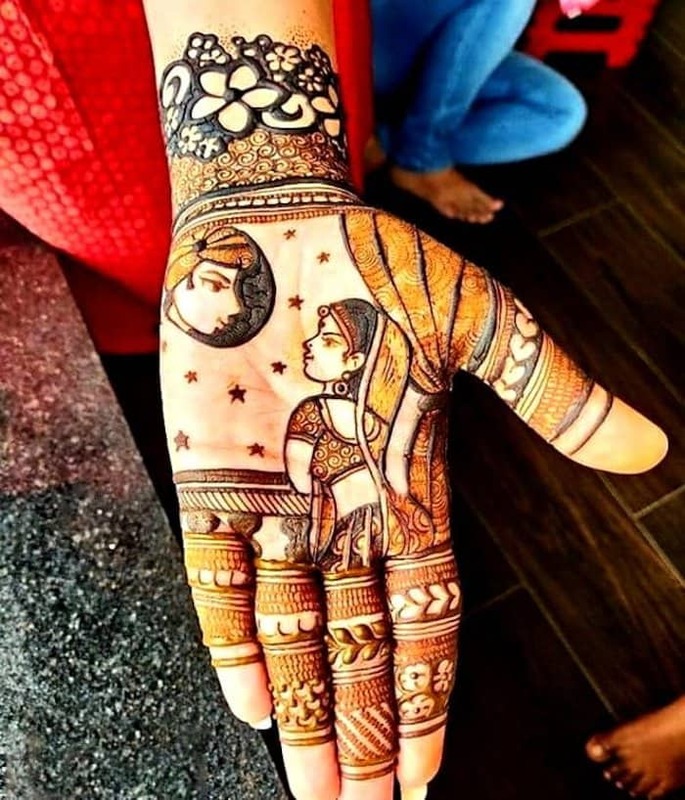 It is the work of professional mehndi artist also depicting the Karvachaut ceremony where the bride is seeing the moon and peacock pattern design is also there. 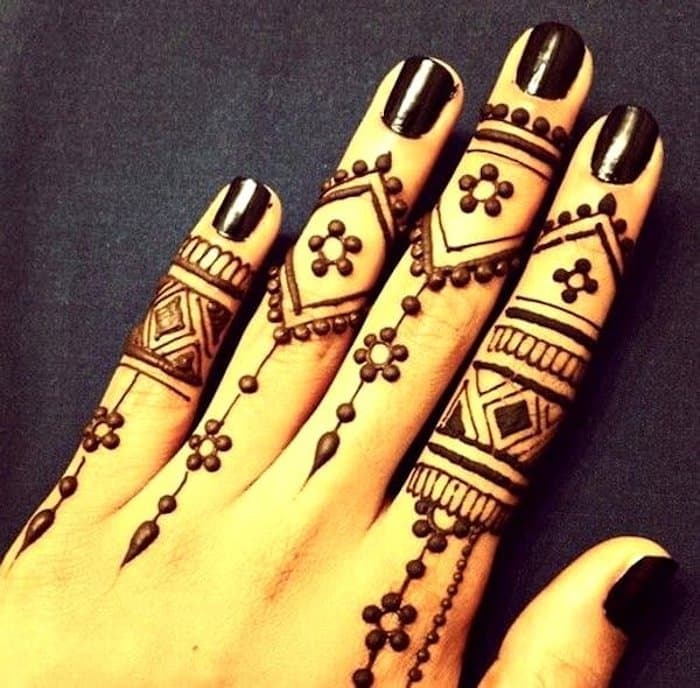 These character henna designs are latest mehndi designs that are drool-worthy. 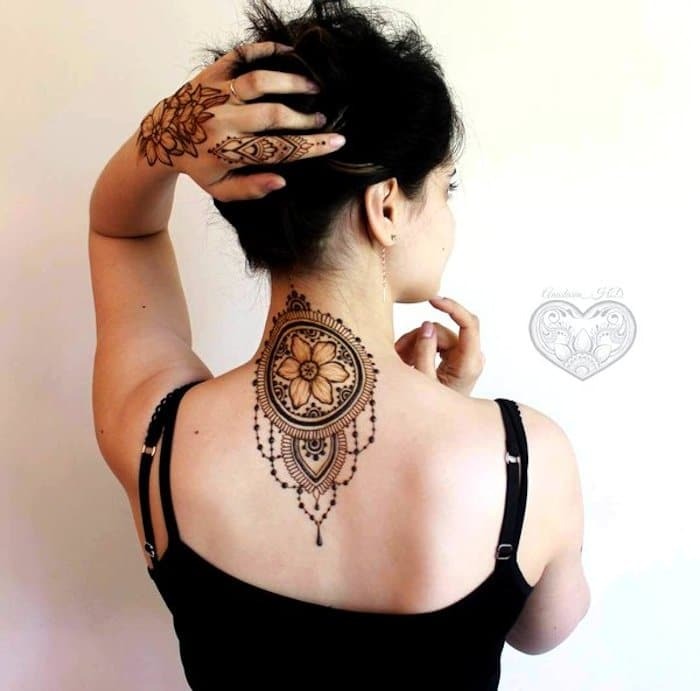 It is the combo of Indian and Arabic henna design. Oh! this one is very beautiful drawn where groom and bride both are seeing each other. On one side there is a Diya and on the other side is a sieve from which bride is seeing her groom. The Karvachaut ceremony rightly done. 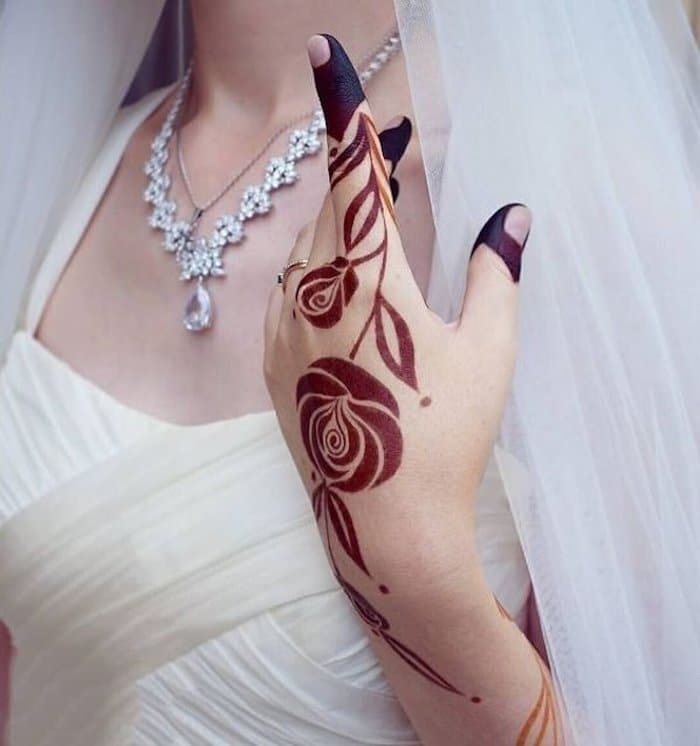 This Henna design is awesomely good where bride is longing for her groom and seeing his picture in the dream. It is like a story or poetry. 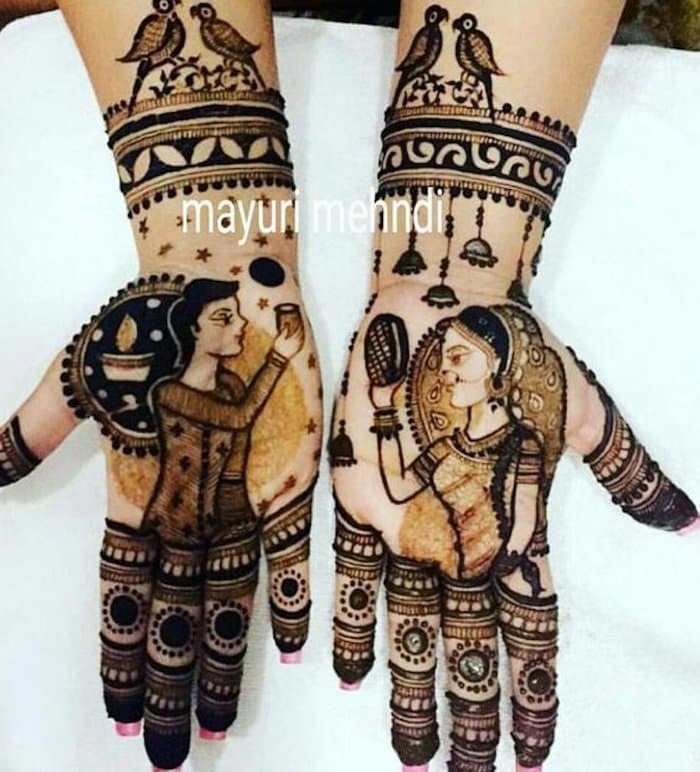 In this henna design, two brides are shown doing the Karvachaut ceremony standing in a temple. It is a beautiful picture and best creativity of mehndi artist. 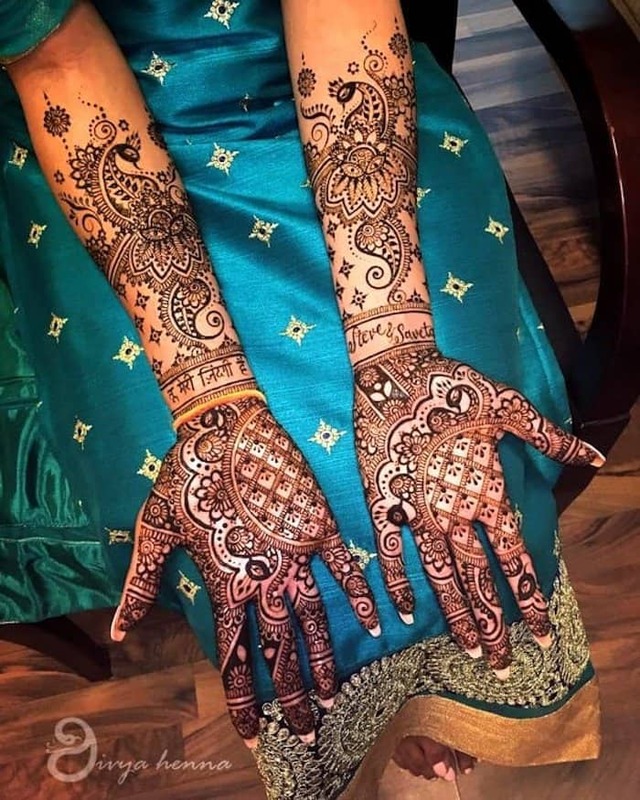 Don’t want to rely on Mehandi artist for your wedding Mehandi? Here is the Mehandi design that is easy, simple to produce, and give you the opportunity to showcase your creativity. You can draw leaf Mehandi designs anytime and anywhere because the patterns involved in the designs are simplistic. To add unmatched beauty to your hands, produce Mehandi on both palms and top of the hands. A fuss-free mehndi art which will look as if it has been done by a professional artist. 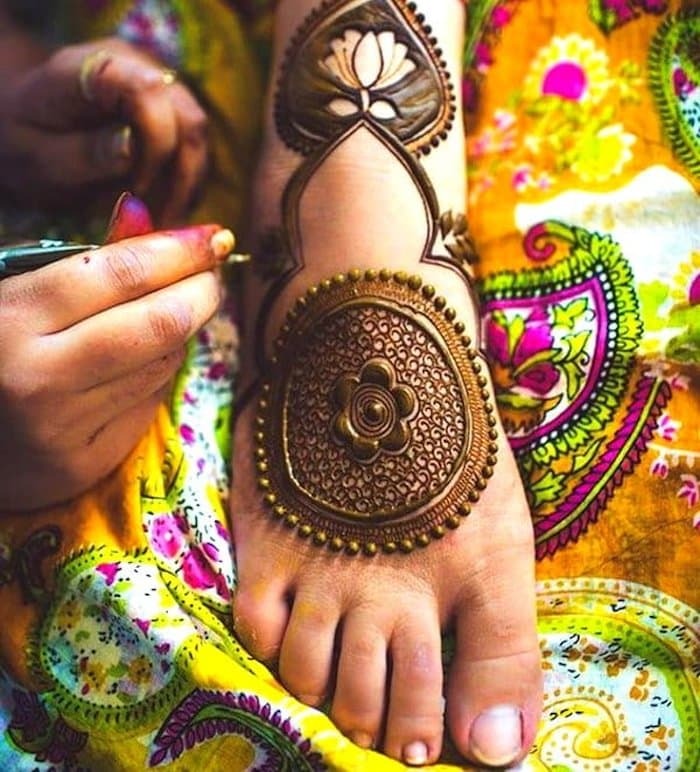 Not just hands, leaf mehndi designs work wonders for the feet as well. It cannot get simple and more elegant than this. Design so easy which even a young girl can draw. You can even add some sparkle to the mehndi cone and draw shiny leaf designs. A perfect blend of modern and traditional vibes. 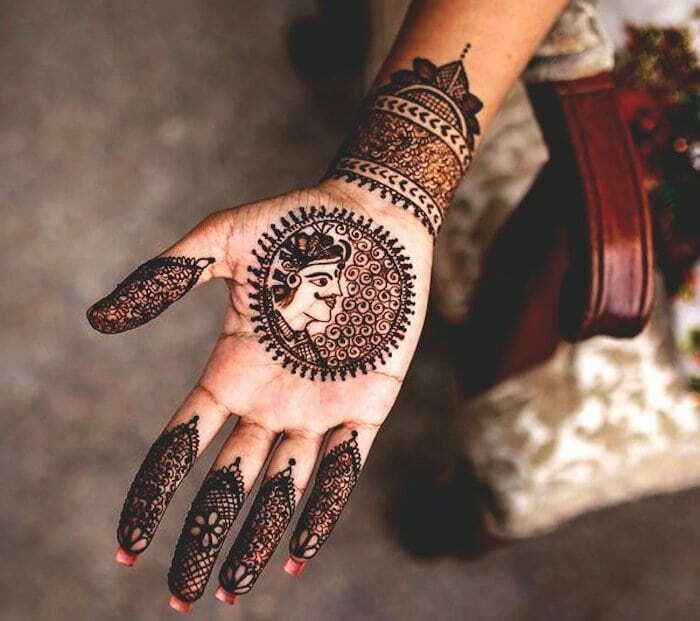 For the bride who loves simple and understated mehndi art. The very idea of Mehandi designs without the touch of necklace jewelry sounds incomprehensible in the modern day. 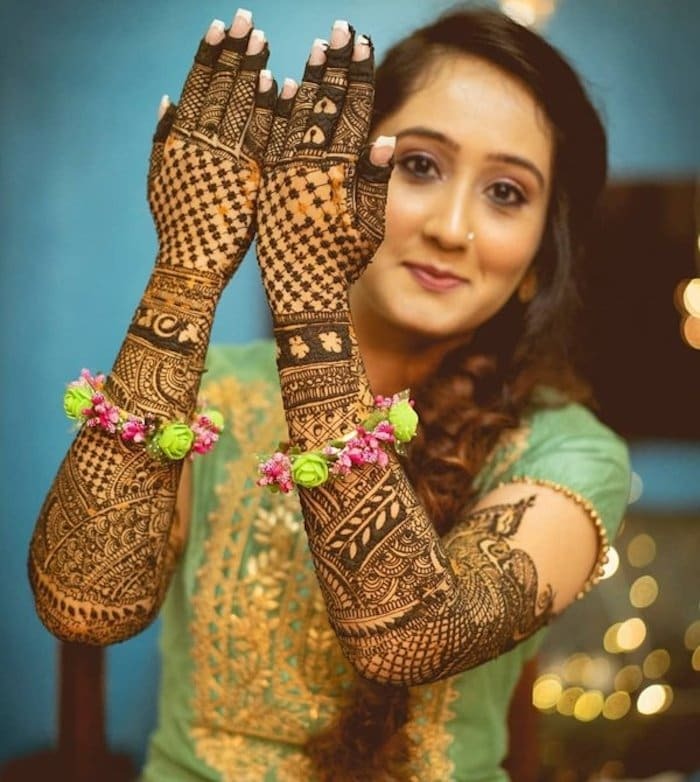 If you are done with same dull, and age-old traditional Mehandi designs, necklace Mehandi designs are the best alternative to attain a groovy and enchanting look. We are pretty sure that you will go head over heels for the Necklace Mehandi designs listed below. 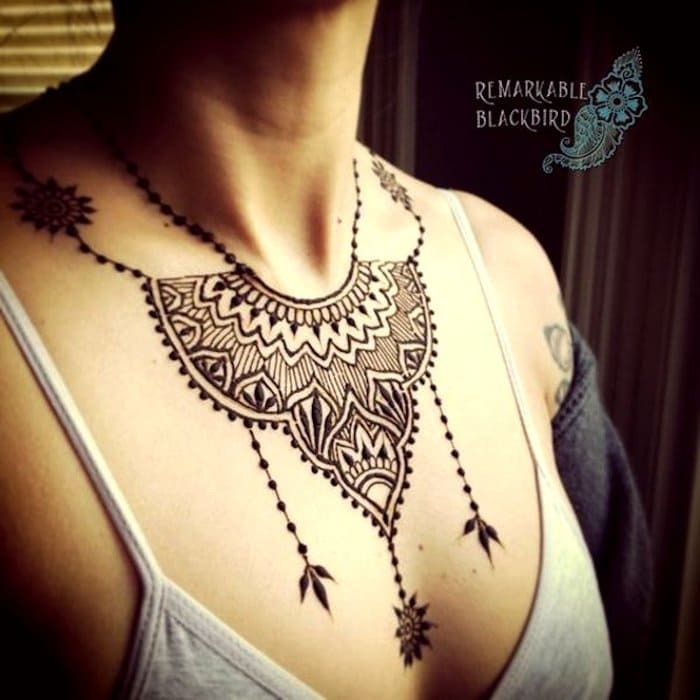 If you love tattoos but can’t get a permanent one, then such edgy and temporary mehndi based design is an ideal choice for you. Ethnic yet supercool design to make a fashion statement. Such kind of necklaces only costs your time, patience and efforts. Not your hard-earned money. Wear this design with any outfit and you will look simply STUNNING! 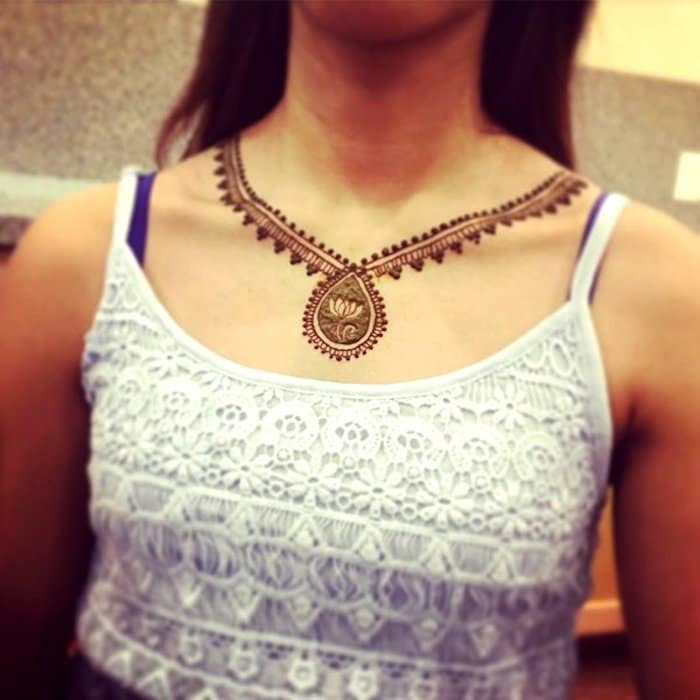 Simple and easy to create necklace mehndi which looks charming. For a girl who doesn’t like to play by traditions. Mind-blowing jaali and floral-jewelry style mehndi design. 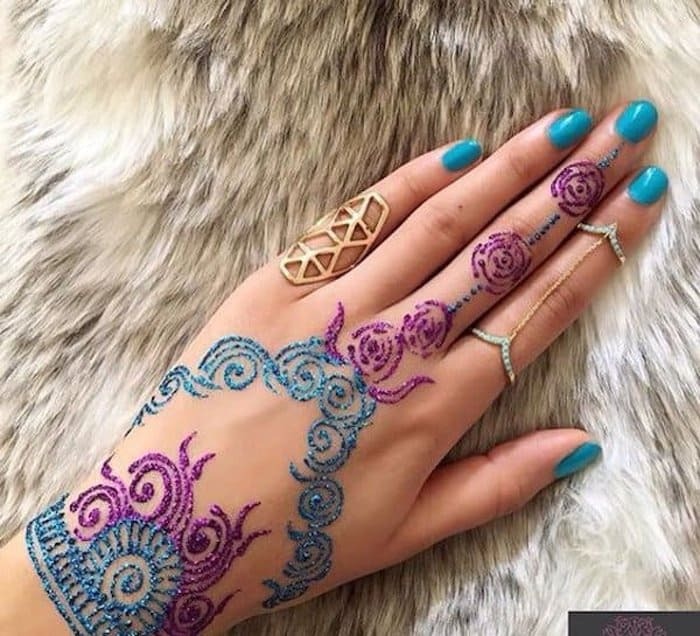 Who needs a hathfool when you have such gorgeous jewelry style mehndi designs? Peacock is the national bird of India as well as an epitome of beauty, grandeur, and divineness. You can draw immense inspiration from the Peacock and blend it to the most enchanting Mehandi designs that makes your hands look eyeballs grabbing and ready for any festive occasion. Check out the alluring Peacock Mehandi designs below. Isn’t this mehndi is the perfect blend of traditional and Peacock design? Intricate but at the same time outrageously beautiful. The center of attraction of this peacock mehndi design is stunning band design on wrists. When you have this peacock mehndi design on legs, there is no need to deck up with jewelry. Just 3 words for this Peacock mehndi design: Plain, Bodacious, and classy. The perfect blend of glitter is what giving this mehndi design a super ravishing look. The English & Hindi Text in between this full hand Peacock Mehndi design is giving it a striking look. The picture perfect peacock mehndi design in every sense. 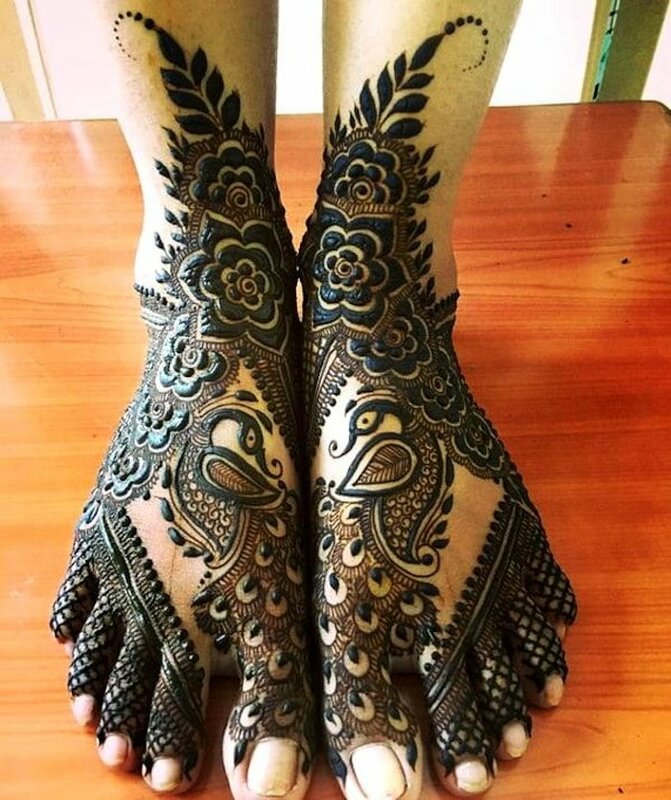 An ideal barefoot peacock mehndi design for feet to take some inspiration. This image is one fine example of mirror reflecting peacock mehndi design. This is how you represent the two different styles of mehndi designs at the same time. On one hand mandala mehndi designs and on the other one, peacock mehndi design. 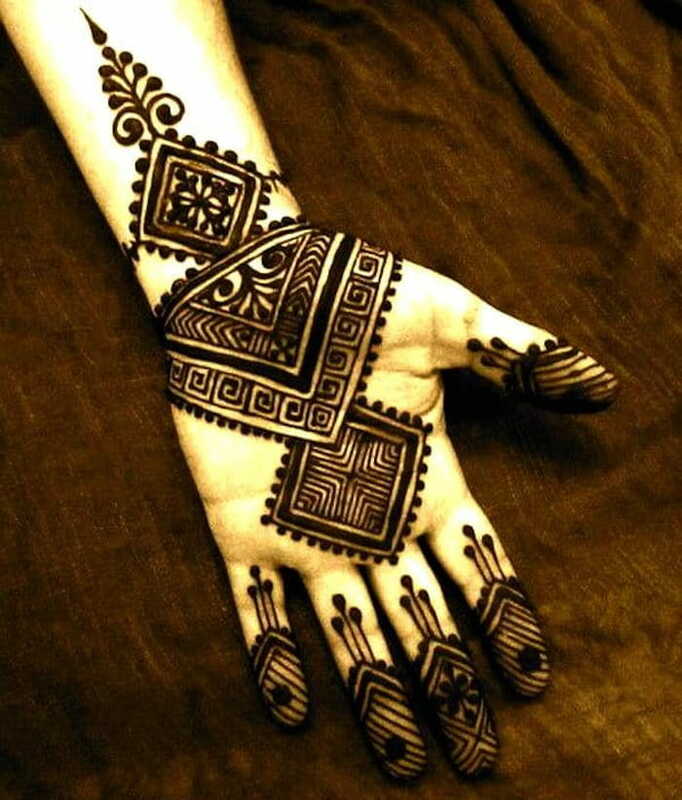 Here’s a mehndi design which a majority of the women don’t know about. Khafif mehndi design is actually the modern day version of Arabic Mehendi designs, with more amazing patterns and styles. 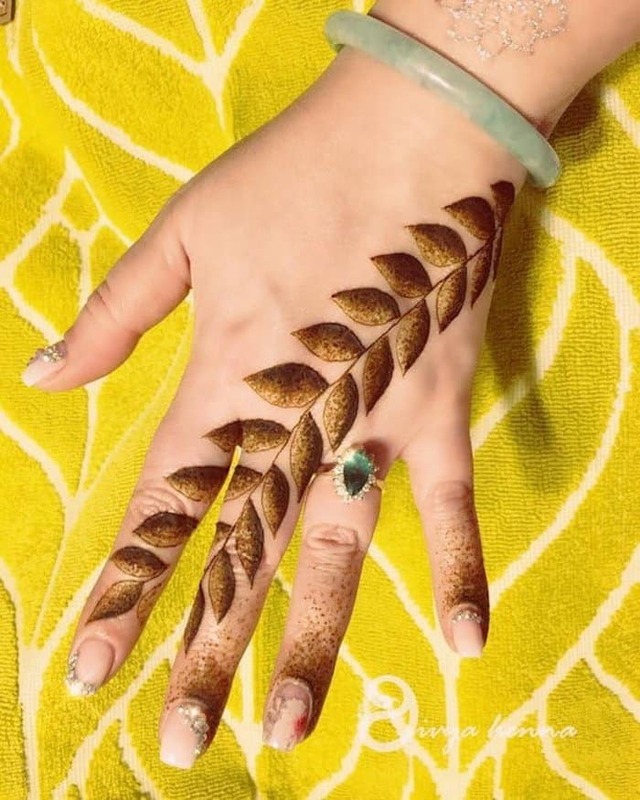 Although the origin of Khafif Mehandi designs lie in Arabic Mehndi design, but their unconventional and out-of-the-box patterns give them a separate identity. Check out the images of super-stylish and graceful Khafif mehndi design below. 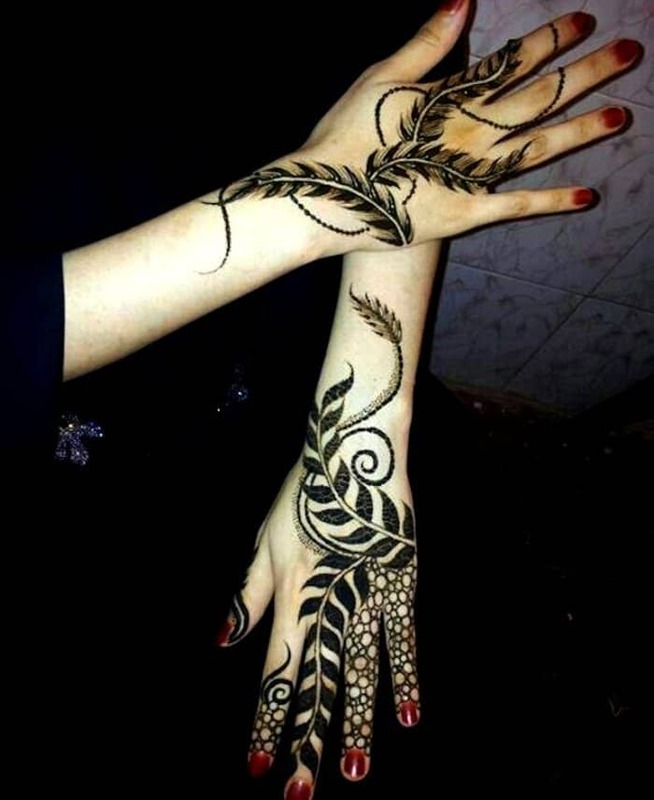 This one is the upgraded version of typical floral Arabic Mehndi design. A khafif mehndi design with a blend of floral and fingertip mehndi design. This khafif mehndi design is redefining the meaning and beauty of the art. Have this khafif mehndi design and you will stand apart from the pack without any effort. Right after your wedding, you toss away your wedding outfit, wedding jewelry, and all the other stuff like they are obsolete. But one thing that stays with you for long is your bridal Mehandi. 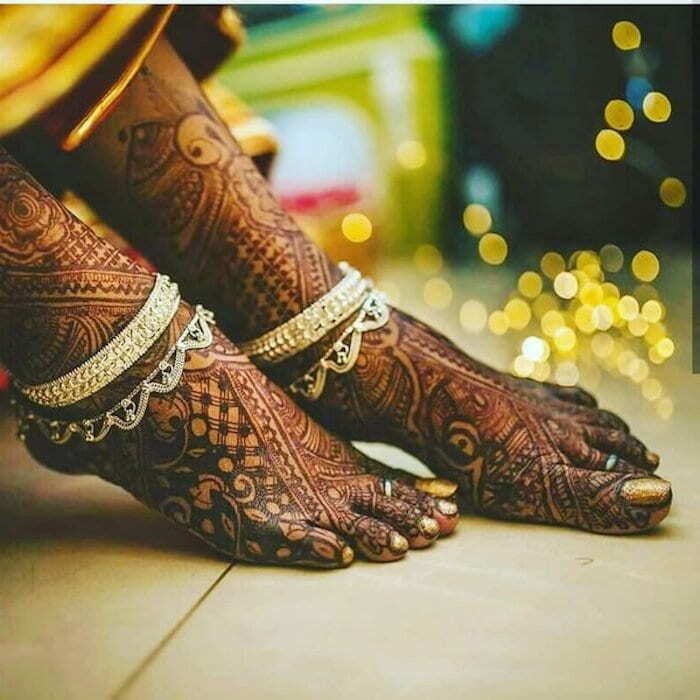 The application of Mehandi on bride’s hands and feet is an indispensable part of the Mehandi ceremony at Indian weddings. For a bride-to-be, it is a symbol of love for her prince charming and as per rituals, it is a sign of good omen. 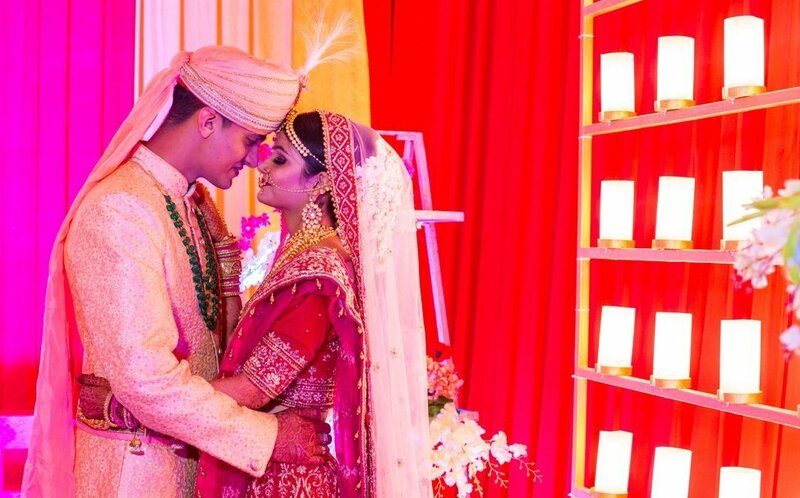 Moreover, the Mehandi ceremony is the only ceremony where a bride gets a chance to sit calmly, away from her phone and the hustle of wedding preparation and savor the mirth moments with loved ones. Apart from being a ritual, Mehandi has its own medicinal significance. 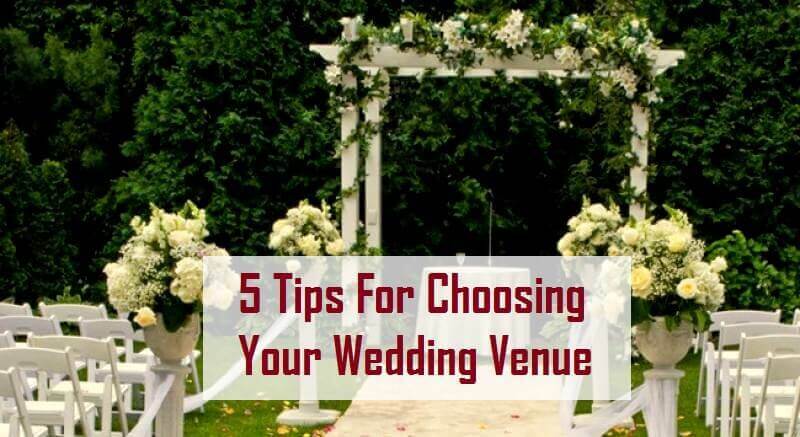 The immense stress of the wedding preparations and the pre-wedding jitters can cause minor physical and mental issues like body ache, mental exhaustion etc. The green henna paste helps to exterminate the stress and cool down the tensed body quickly. Enough talk about the predominance and properties of the Mehandi. Let’s hop on straight to the fascinating wedding simple Mehandi designs we’ve collated for you. 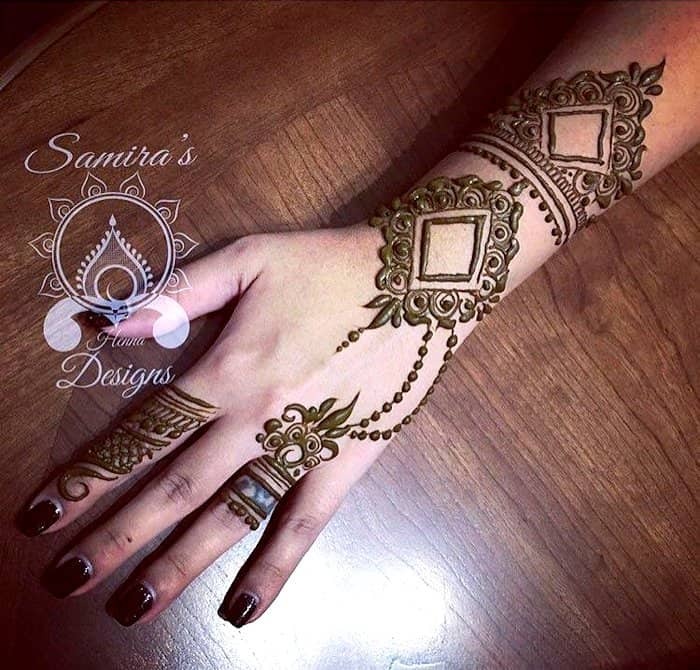 Simple Mehandi designs are massively popular among the girls and brides-to-be. When you have nothing else to choose, simple Mehandi designs are the ultimate option to go for. 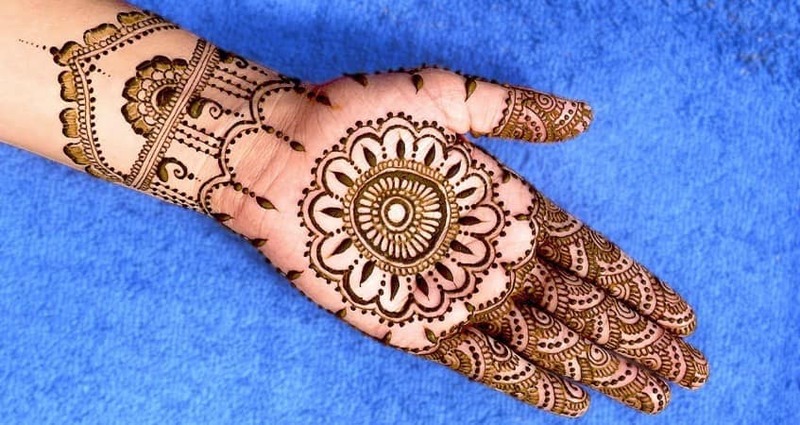 In the Indian festivals, Mehandi is usually drawn on the hands, legs, and top of the palm. Mehandi is considered as a sign of good omen and brides-to-be applying Mehandi embodies the affection for the groom and his family. 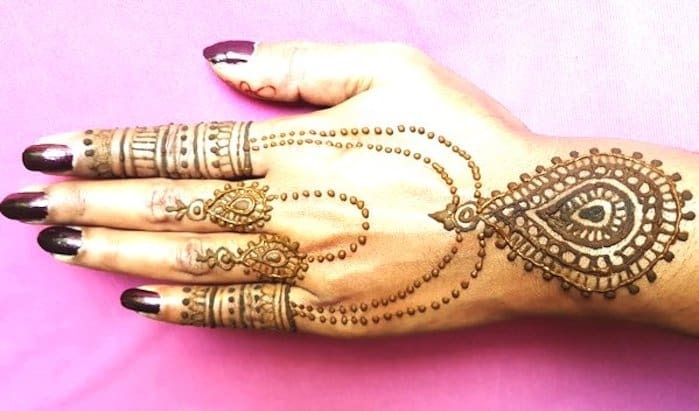 Simple Mehandi design comprises a myriad of stunning and beautiful patterns that can amp up your overall bridal appearance and may turn some heads at the wedding. 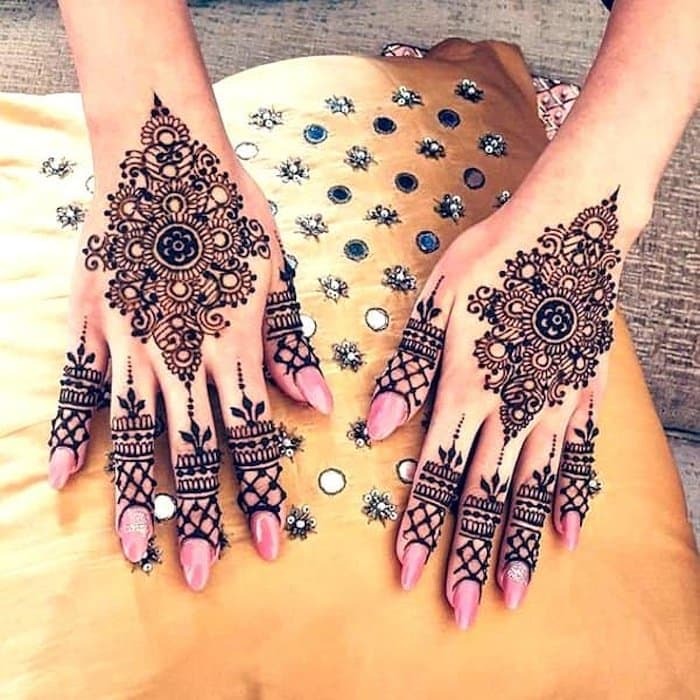 You can apply the simple mehndi designs on your hand, feet, palm, legs, and even on the shoulder to beautify your body and bridal appearance. If you want to keep up the things simple and low key, go for Mandala Mehandi designs and floral Mehandi designs. 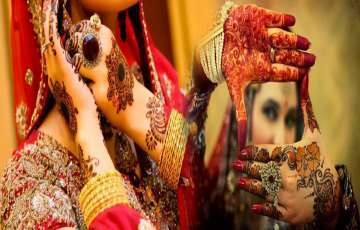 But if your goal is to take the bridal appearance notches higher, lotus motif, Arabic, and elaborative Mehandi designs are worth considering. 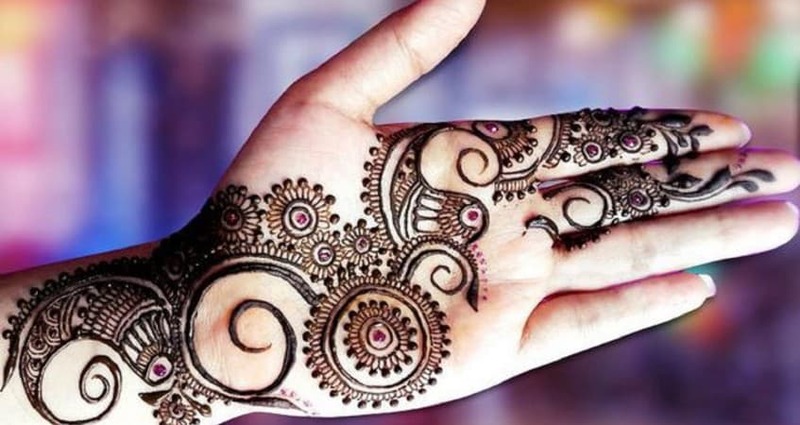 To give the Mehandi more mature look, you need to take care of a few things. 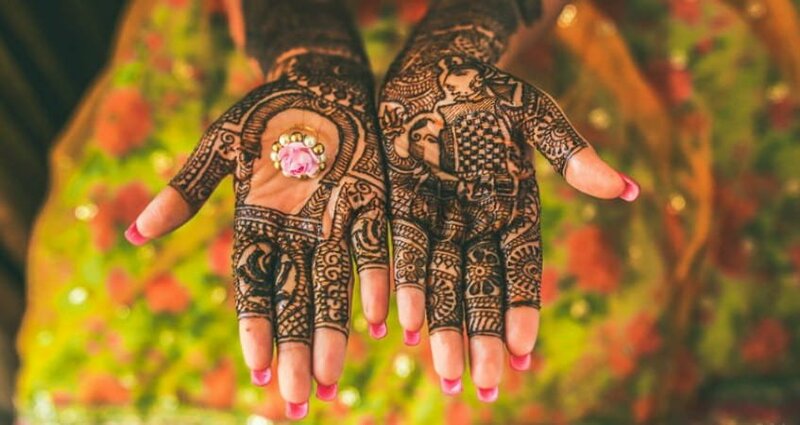 Firstly, make the paste of Mehandi by using dry Henna and store it for a considerable amount of time to make the Mehandi richer in color. 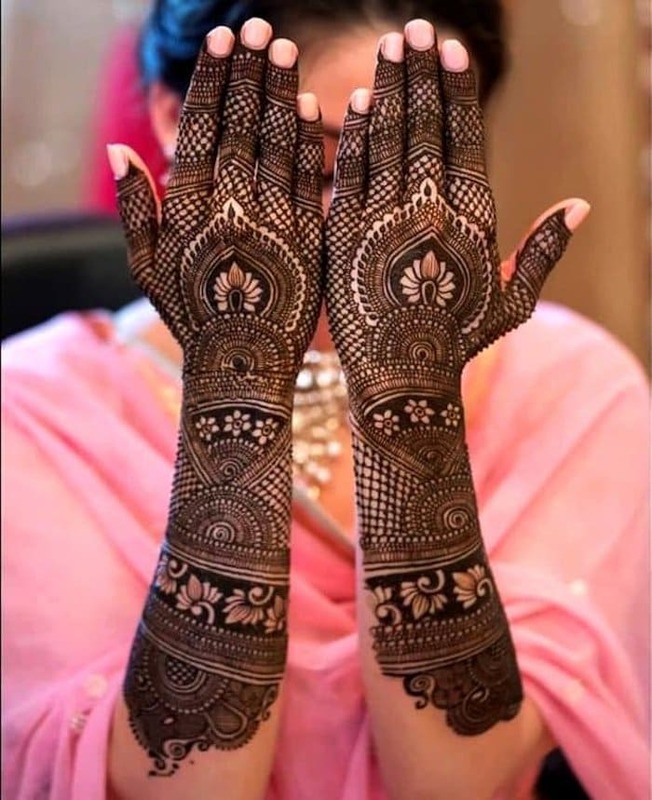 After applying the Mehandi, keep it for at least 7-8 hours to give a rich darker color. So what you have chosen for you, your favorite wedding mehandi design? Mehandi on wedding, this custom is from ages that has been in practice for long time. 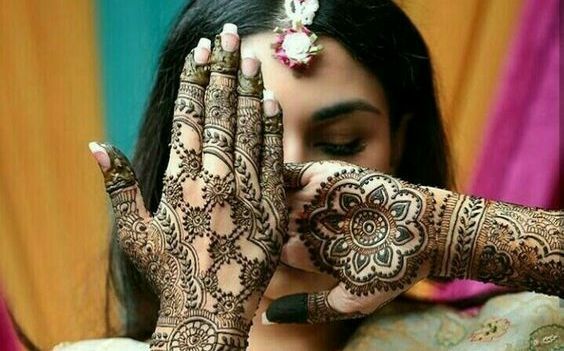 It is also said that mehandi has some substances which help in fighting certain infections as decreasing the growth of tumors and inflammation, and also relive pain. Hence mehandi is not just for weddings. It also has medicinal properties too. Great my friend, you have brains. 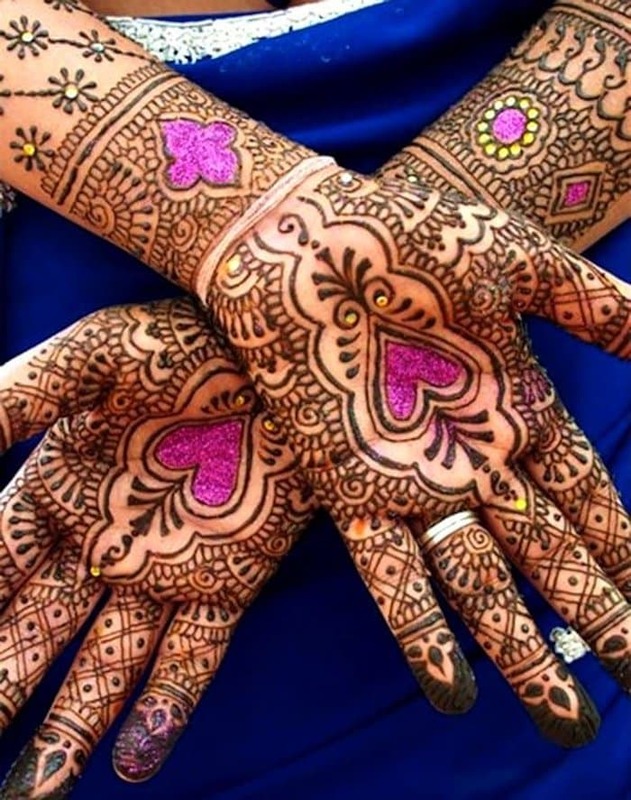 You have shared some truly fabulous mehendi design in this blog post. I am just speechless, what a great blog post!! 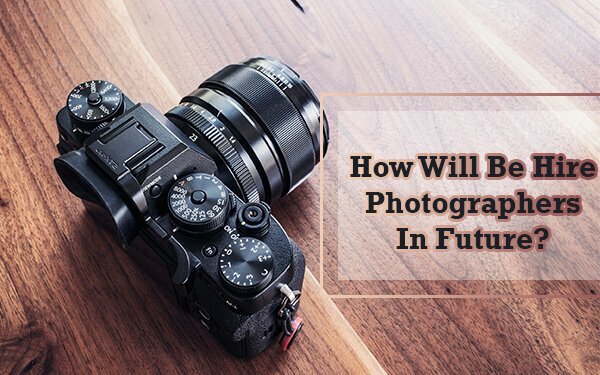 This blog will really help me improving my career.